Ducky's Always Hungry | Let's eat our way through life! If you’ve been reading my blog, then you know that I try to put out a blog post at least once a week. However, my posts have been absent for the past month or more. Unfortunately, life happens. I will continue to try to put up new posts as frequently as possible – and I have lots of posts to get too – but the rate of posting will probably slow down. Thank you for following my blog, and I hope to continue this food journey for as long as possible. In the fall of 2016, my husband and I took a quick 48-hour, weekend getaway to Atlanta. While neither of us had ever been before, we made the trip specifically for one purpose, and that was to visit Zoo Atlanta, specifically to see the pandas. Luckily, we had time to do more than just visit the zoo, including a trip to Georgia Aquarium, Centennial Park, and World of Coca-Cola. During this whirlwind trip to Atlanta, we chose to stay at a hotel right in downtown, and without renting a car, we were semi-limited to where we could go out and dine. Fortunately for us, within walking distance to the hotel, there were quite a few good food options that we discovered. 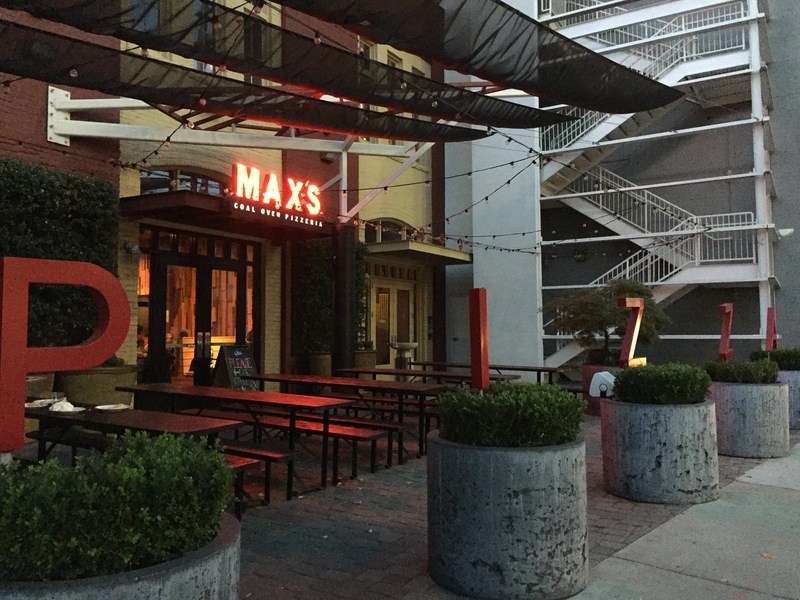 My husband discovered Max’s Coal Over Pizzeria right in the heart of downtown Atlanta. Max’s claim to fame is to be the only coal-oven pizzeria in the entire state of George. This pizza joint specializes in New York-style thin and crispy pizzas that they’ve been serving up since 2009. With indoor and outdoor seating, the atmosphere is electric, fun and relaxed. This is the perfect neighborhood pizza joint to stroll into for a good pie topped with Max’s own secret recipe red sauce. There’s also built-in entertainment with an open kitchen as you can watch pizza dough being thrown until its paper thin, your pizza being made to order, and the awesome power of the coal-oven pizza as it bakes your pizza pie to perfection. 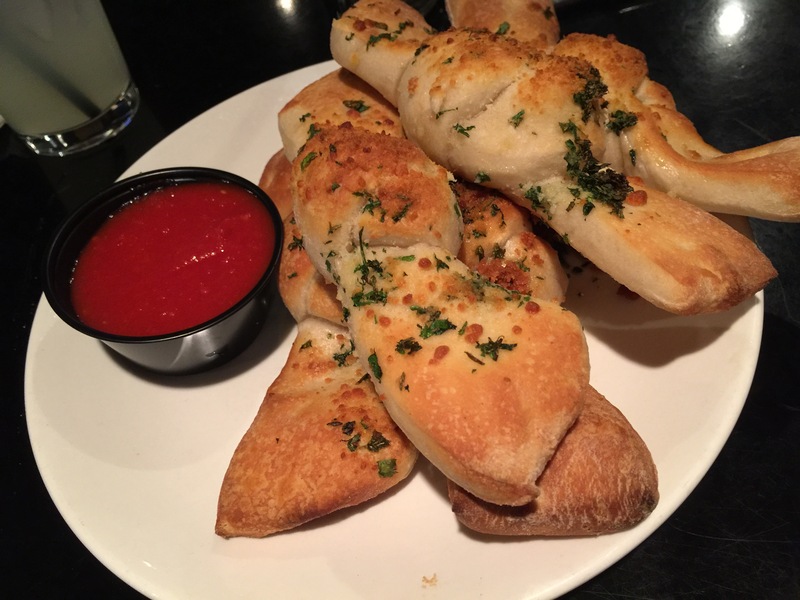 Before starting with a pizza, we decided to order an appetizer of garlic knots served with marinara sauce to get our evening going. Exactly as described, these were garlic knots! Bread dough literally tied into a knot, or a bow, then brushed with garlic butter and parmesan cheese, baked to a perfect golden brown, topped with more garlic butter and sprinkled with chopped parsley and served with a dipping bowl of marinara sauce, these knots were delicious and hearty. The knots had a garlic flavor to them, but without being so overpowering. It was a good combination of garlic and butter to add a hint of sweetness and make it so that the bread was flavorful and not dry. The dough was perfect, crispy and crunchy on the outside and airy and light on the inside so that it wasn’t dense. Five garlic knots to one order of garlic knots was just perfect as an appetizer for the two of us to split. When it came to pizza, Max’s is very clear that they only make one size of pizza, no matter what the toppings you want. Their pizza’s come in 12″ round, which is then cut into 6 slices per pizza, no deviations whatsoever. Surprisingly, my husband suggested ordering a pizza that I had my eye on, but wasn’t sure he’d want. He later admitted that since we’d be splitting one pizza, it was easier to order something I would enjoy rather than trying to make me conform to something he’d like more. So we ordered a non-traditional arugula & proscuitto pizza. Hey, after all, I am a fancy California girl, and arugula is something you commonly find on pizzas here in California. 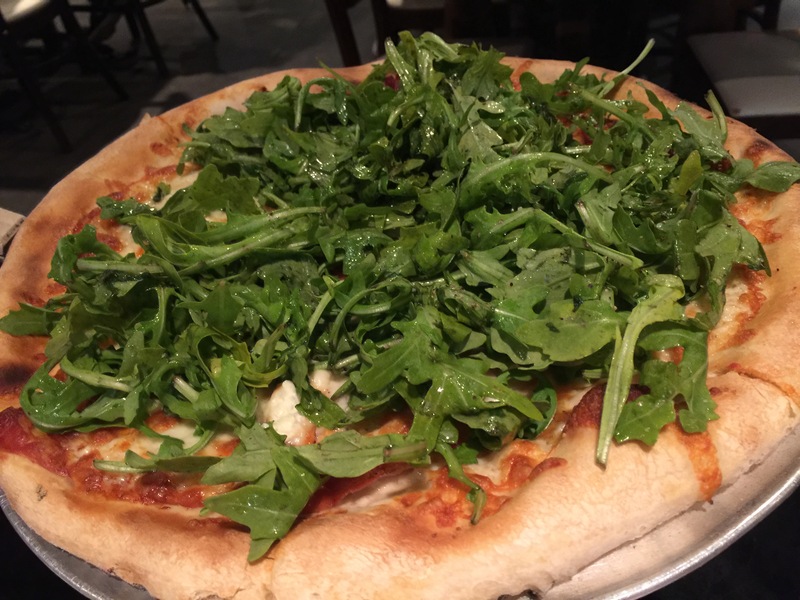 Made with a blend of ricotta and mozzarella cheese, the pizza is then topped with parmesan and proscuitto and dressed with a lemon pepper vinaigrette arugula salad. One bite into the pizza and you discover a couple of things. First, the coal fired dough is fabulous. The dough is chewy around the crust, but with a crispy burnt coal-fire flavor on the bottom of the pizza, which my husband and I love. The sauce for the pizza is subtle and delicious, not at all overwhelming or too acidic from the tomatoes. The prosciutto gives the pizza the light salty flavor it needs to balance out the other strong flavors. The combination of the mozzerella and the ricotta is terrific, both very light and mild cheeses, the ricotta gives the pizza a slightly different texture then your average pizza which generally would only feature mozzarella. And the flavor of the arugula salad with its lemon pepper vinaigrette is vibrant and bright and explodes on your tongue. It’s the combination of salty prosciutto the crunch of the arugula salad, the char of the coal fire crust and the mildness of the cheeses that makes a beautiful pizza. My husband and I just ate it up. It was exactly what I was looking for, and I’m glad my husband indulged me and allowed me to order the kind of pizza I wanted. We decided to finish off our meal at Max’s with some cannoli. 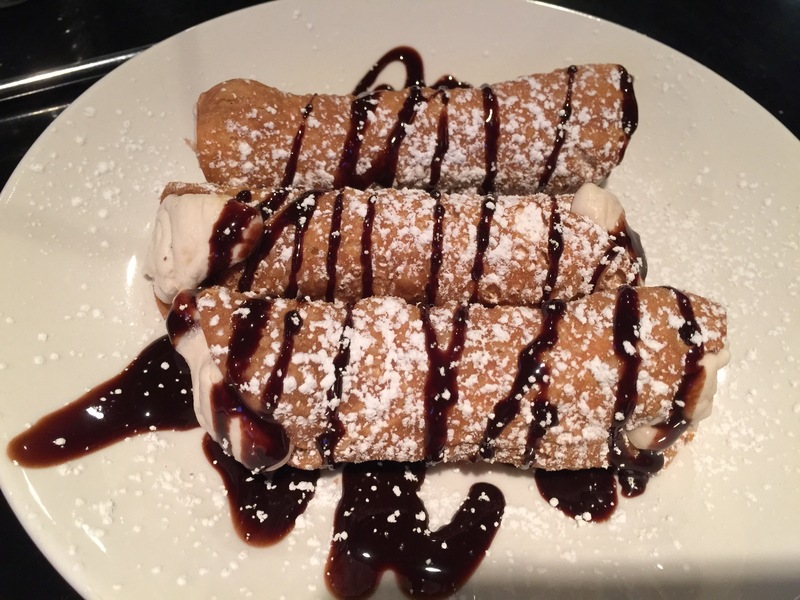 After all, when we got to any sort of an Italian restaurant, and they feature cannoli, we almost can’t resist. How could you ever go wrong with a cannoli? Crispy cannoli shell filled with delicious ricotta cheese filling, with chocolate chips then the whole thing is topped with chocolate sauce and powered sugar. These were so delicious, and with three of them to an order, the biggest question was, who got the third cannoli? Since we both wanted it, we did the fair thing and shared the third cannoli so we each got an equal amount of dessert. Cannolis done the right way are just so delicious and delectable that they are irresistible. My husband did good with his selection of Max’s Coal Oven Pizzeria. As Georgia’s only coal oven pizzeria, they truly produce some terrific pizza. 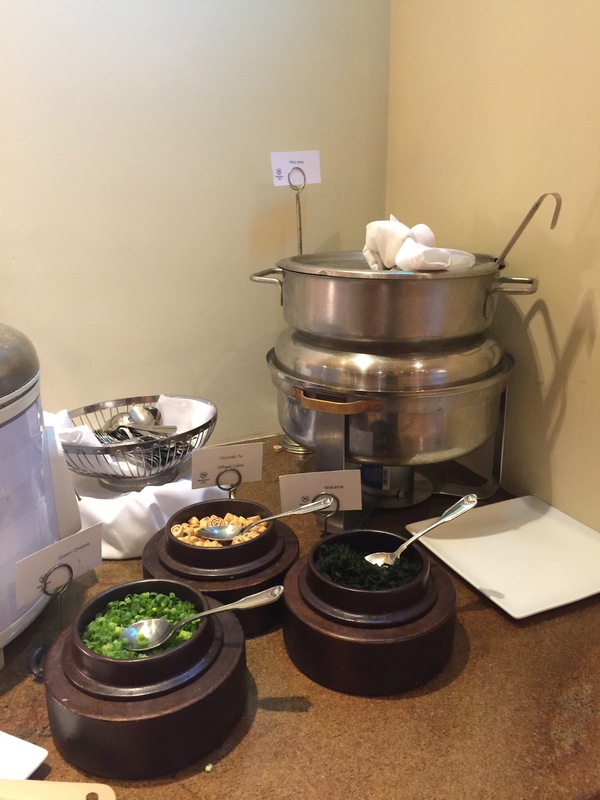 The atmosphere in the restaurant was fun and casual and really revolved around the food. This is the type of place you might see a baseball team come in to celebrate after winning a game, or a couple out on a date night looking for an old-fashioned pizza joint. Our garlic knots were terrific and well cooked, the pizza was full of vibrant flavor and tastes, and the cannolis were the perfect way to round out our meal. This may not be traditional Georgian food when you think of Atlanta cuisine, but this hit the spot for what we were looking for after a long night of travel and a day spent at the zoo with the animals. Over Canadian Thanksgiving 2016, my husband made plans for us to take a long weekend trip to Niagara Falls and Toronto, Canada. Toronto is a city that my husband has wanted to visit for quite a while now but for some reason or another things just never worked out, not even mentioning the fact that for some reason airfare between Los Angeles to Toronto always seems to be so outrageously expensive. But finally, the stars aligned and we planned ourselves a trip to Ontario’s capital city. After flying a redeye from Los Angeles into Toronto and arriving in the wee hours of the morning, we had made plans to pick up a rental car and head out to Niagara Falls for a quick day trip. Luckily, from the airport Niagara Falls was a quick hour-ish jaunt. A beautiful early fall day, we picked the most wonderful day to travel out to the US-Canada border. After returning back to the airport to drop off our rental car, we made our way into Toronto and arrived into this great metropolitan city late in the afternoon. We had made plans later that evening to enjoy a meal with a view at a restaurant within walking distance to our hotel. 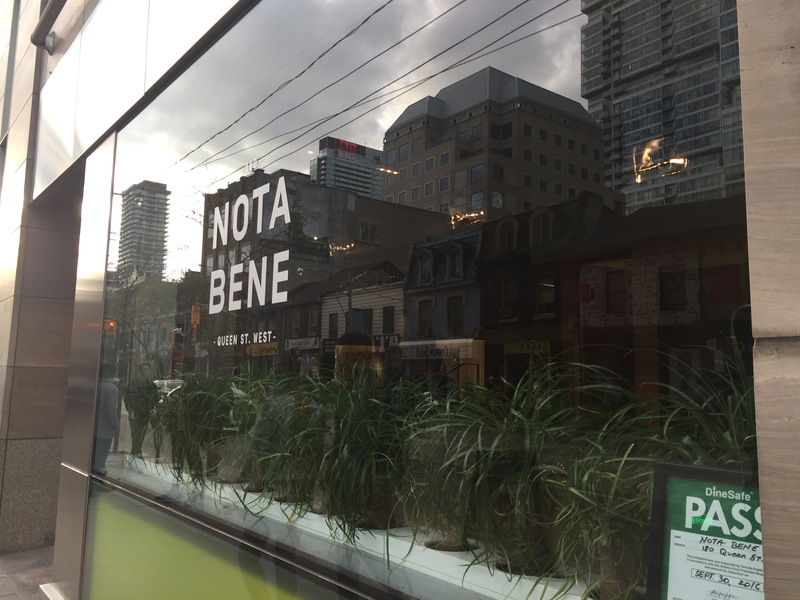 With an expansive interior dining room that is decorated in a very minimalistic style and accentuated with earth tones and wooden accent pieces, the entire dining room is surrounded by floor-to-ceiling windows that look out onto the beautiful skyscape of downtown Toronto and Lake Ontario beyond that. 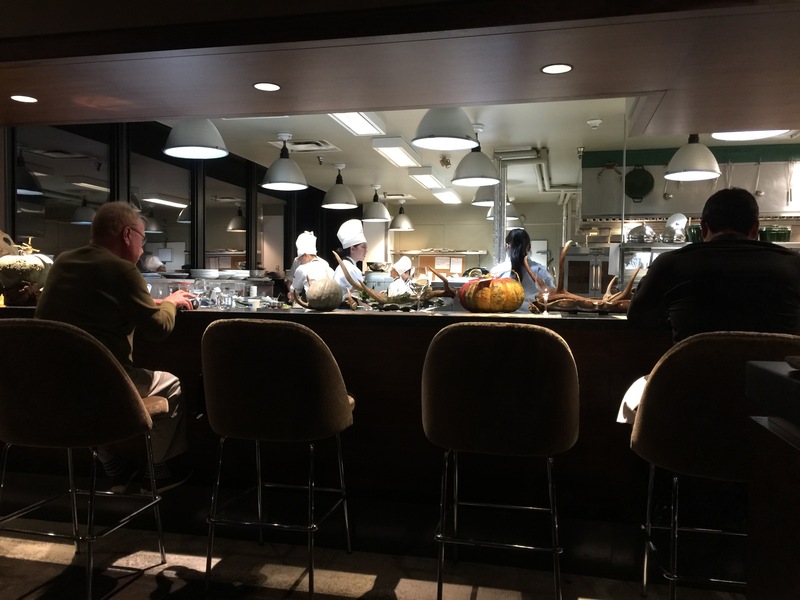 In one corner of the restaurant, nearest to where we were seated was a beautiful open kitchen with some bar-style seating for those who wanted a front row on the inner workings of a world class restaurant. Canoe has often been listed as one of Canada’s top restaurants and dining here, it’s easy to see why. Canoe Old Fashioned made with Crown Royal Northern harvest rye, Maker’s Mark bourbon, sugar, Angostura bitters, and orange peel was my husband’s drink of choice. 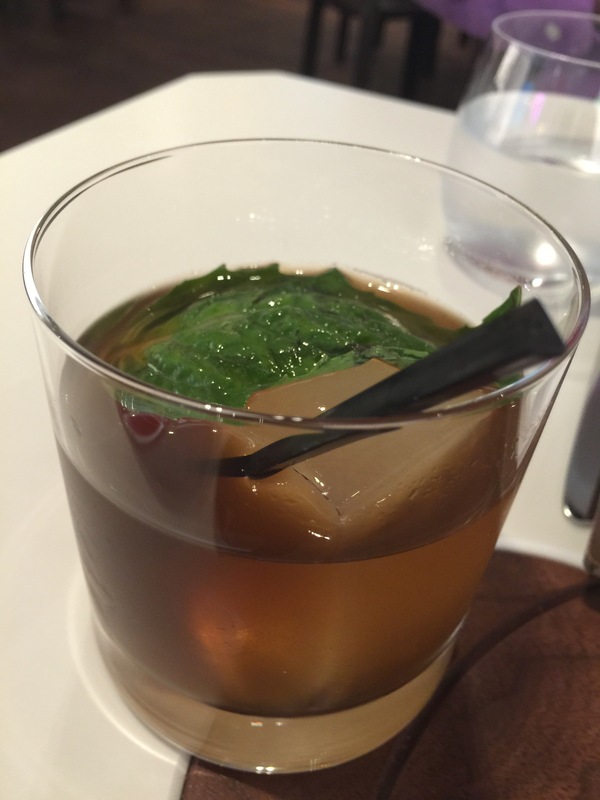 After a sip of his drink, his comment was “thumbs up!” He thought that the Canoe Old Fashioned had the right mixture of rye and bitters without too much orange. 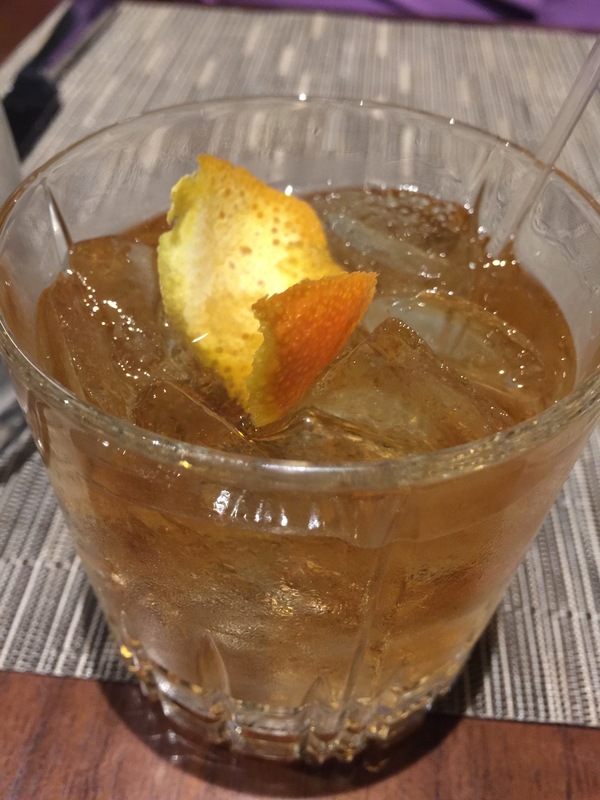 In other words, there was the essence of orange, but it wasn’t the primary ingredient in the drink, and the drink was nice and strong. Prior to our meal arriving, we were served with Canoe’s own potato and bacon bread which was served with a white bean and sumac spread. The bread was fantastic, but very dense and filling. It must have been the potato which caused the bread to be so dense as it looked light with a bunch of air pockets, but picking up a piece and you could feel the density. After a bite into the bread my husband’s comment was, “whoa!” The bread was incredible with a light potato and bright bacon flavor. You could clearly taste both ingredients in each bite. The white bean and sumac spread was interesting, somewhat like hummus in texture and slightly in flavor. However, I think my husband and I both liked the bread on its own without the spread so much. Since we had been traveling, essentially since the previous evening when we flew our red-eye flight, and didn’t really stop to have a proper lunch at Niagara Falls, we were starving by the time dinner came around. For his starter, my husband chose the s’mores foie gras. Personally, I didn’t think that sounded appealing at all, but luckily, we weren’t sharing an appetizer, so my husband could order whatever he wanted. The s’mores foie gras was served with graham cracker crumble, chocolate sauce and toasted marshmallow cream, everything you would have assumed would be a s’mores treat, well, except for the foie gras. 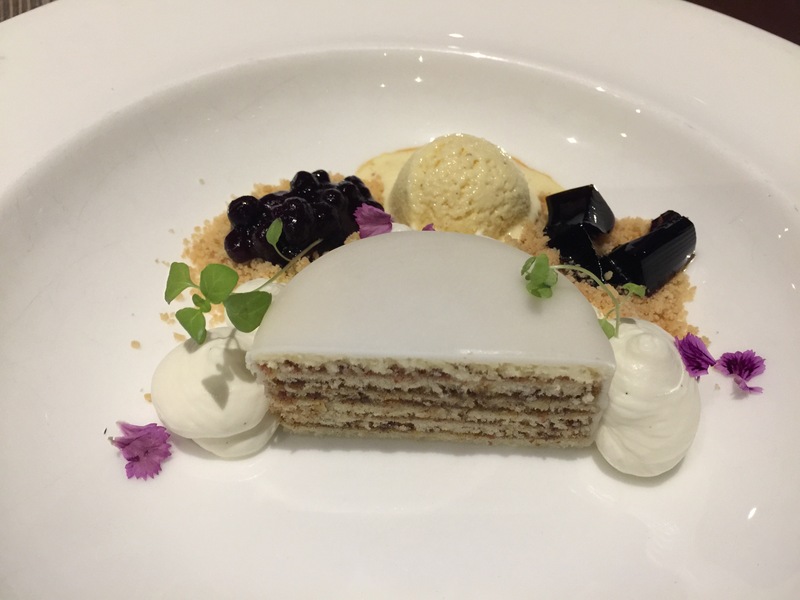 My husband really enjoyed the smoky caramelized marshmallow foam, it added that depth and layer of flavor. 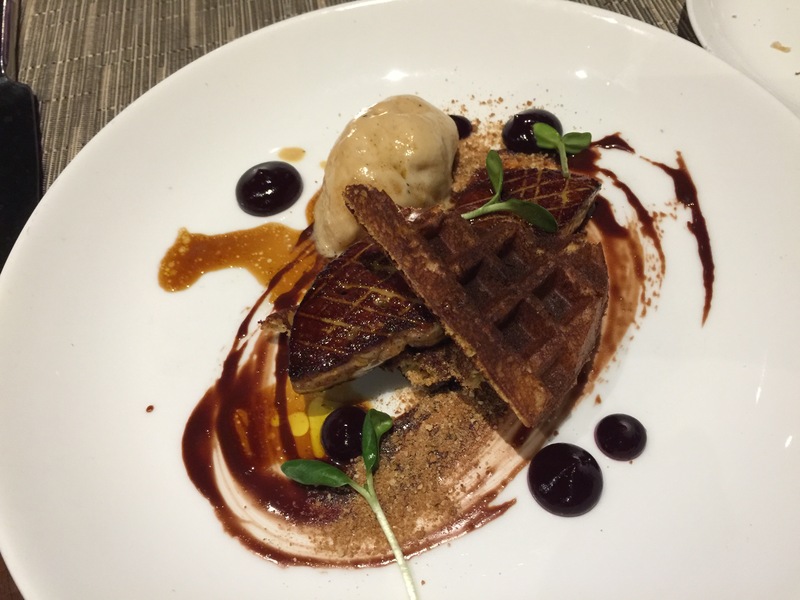 The combination of the foie gras and the chocolate sauce was a winning one in my husband’s estimation. 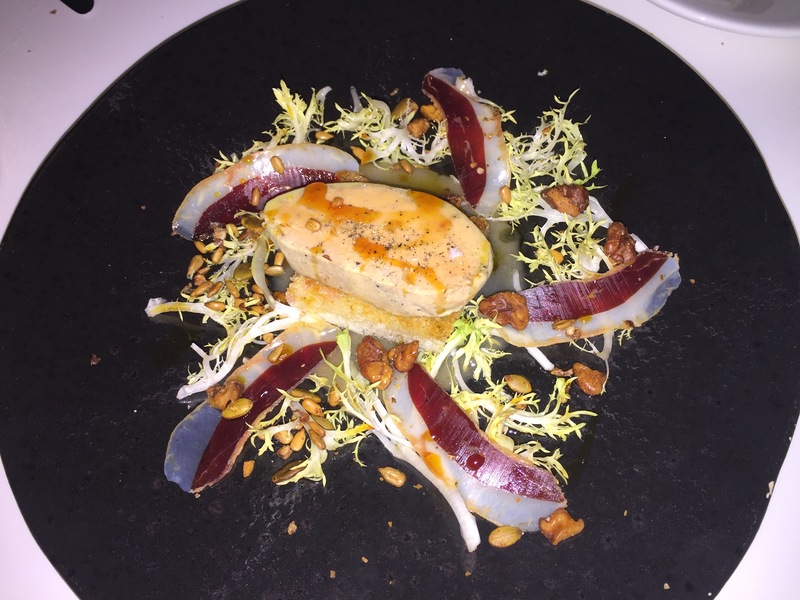 He thought that the foie gras was so rich and tender and the sweetness of the chocolate sauce just added to both the sweetness and richness. The waffle it was served with added depth and a blank slate for flavor as well. 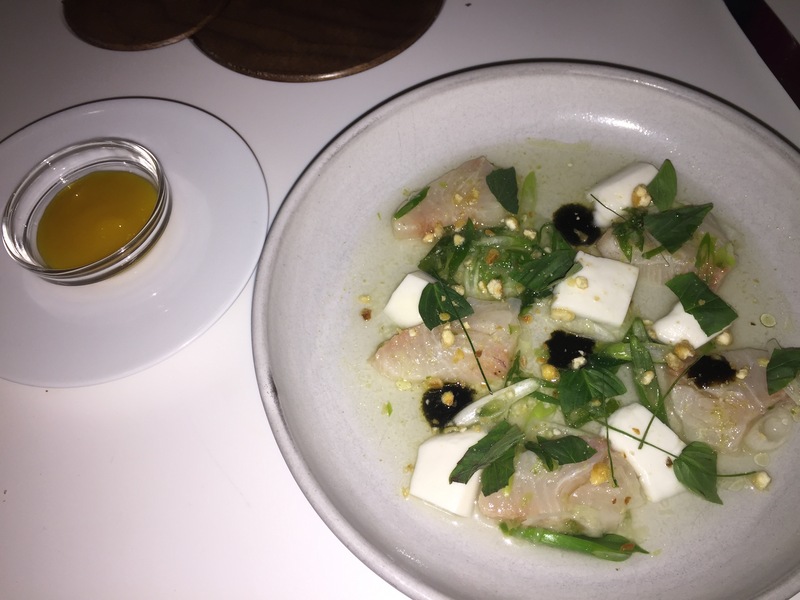 The dish was so rich and creative, it was hard to tell if this was more like a dessert or an appetizer. My husband loved the creativity and he even said that if this wasn’t such a classy restaurant, he’d be tempted to lick the plate clean as the graham cracker crumble, rich foie gras, marshmallow cream and chocolate sauce were such a fantastic combination. I went with a completely different type of appetizer. 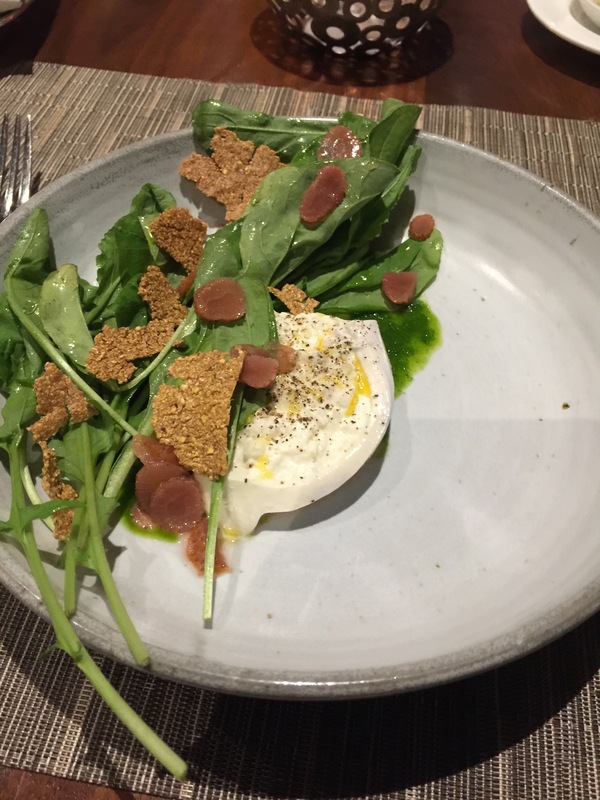 My choice was the Ontario burrata served with unripe strawberries, arugula, K2 Milling crisp, and smoked canola oil. Can you ever go wrong with burrata? Add in the idea of unripe strawberries and it just sounded intriguing. The plate, much like my husband’s s’mores foie gras was so beautifully and artistically plated. The burrata itself was very fresh, and rich and creamy. The creamy inside of the burrata was heavenly. Combined with the unripe strawberries, which had a tang to them, and the peppery arugula, it was a combination of creamy, tangy, and peppery. The K2 Milling crisp added crunch and texture and yet another different flavor component. Even though each ingredient had a different flavor profile, they all seemed to compliment each other quite well. My favorite flavor on the profile was the arugula pesto that really just brought all of the ingredients together into one cohesive dish. When it came time for dinner, I decided to go for something filling and heavy. My entrée choice was the Ontario beef rib eye. Apparently, I was very interested in everything that was locally sourced from the local province. 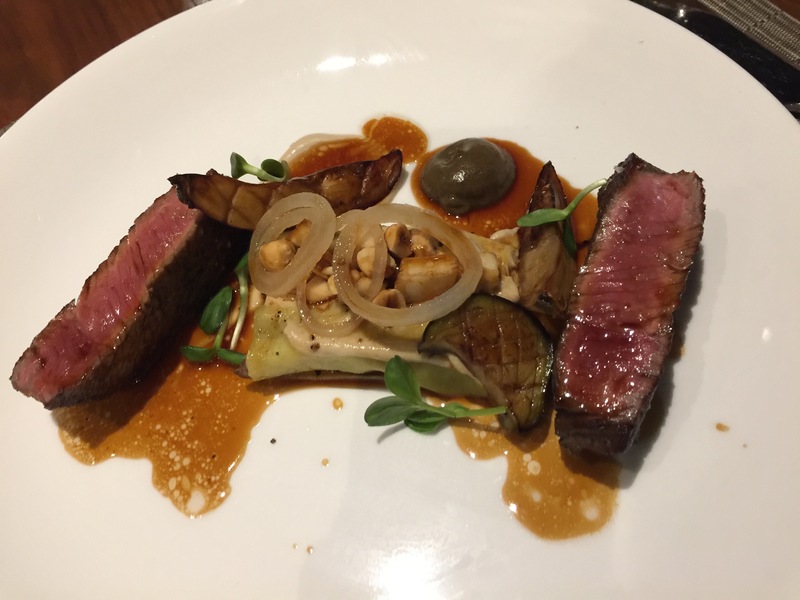 The Ontario beef rib eye was served with braised short rib cannelloni, B.C. pine mushrooms, charred eggplant, Mill St. AP sauce, and Okangan hazelnuts. I really loved the rib eye, it was so tender and juicy and flavorful. It was cooked to a perfect medium rare, as requested. However, I will say that the beef was a little bit fattier than I had expected it to be, so I could have done with a little bit less fat. The short rib cannelloni was different and interesting. The short rib was tender and delicious, the idea to put it into a cannelloni was creative, but somehow didn’t seem cohesive on this dish. The charred eggplant and the hazelnuts actually worked as accompaniments for the dish and the Mill St. AP sauce is definitely a Canadian thing that requires a bit of an acquired taste that I just don’t have. But the star of the dish was certainly the beef, and the beef is what’s for dinner. My husband also decided to try out a meat dish in the form of venison. Cerf de Boileau venison served with swiss chard, mulled lingonberries, preserved garlic scapes and wheat berries. It was the addition of lingonberries that intrigued my husband about this dish, and being a lover of venison in general, he couldn’t pass up the opportunity. While this dish had a lot of ingredients and a lot of strong individual ingredients, the combination of flavors was perfect. Served on a maple leave embossed plate, the highlight was the venison, which was very well cooked. The lingonberries provided the tartness and punch of flavor that the dish needed to counteract the gaminess of the venison. The dish was filling, but my husband had no problems whatsoever in clearing off every last scrap of food off of his plate. We may have eaten a lot of food by this point, but we still had room for dessert, and after looking over the dessert menu, we each decided to get our own dessert. For my choice, I went with the milk chocolate + kernel peanut made with 46% milk chocolate, banana butter and caramel ice cream. Alright, anything called banana butter is going to get my attention. Again, like every other dish we’d been served at Canoe, I absolutely loved the creativity of how the ingredients on the dish were combined, put together and plated. The banana butter was more like banana foam that provided the base for the other ingredients on the dish. The banana butter had a nice subtle banana flavor that was terrific, but it wasn’t too sweet so that it overpowered the chocolate. The chocolate cake was spongy and moist and was a perfect textural contrast to the banana butter. The peanut brittle was fanatic and the chocolate had just the right touch of sweetness and cocoa flavor. This was the perfect dessert for someone like me, with my tastes, to enjoy. My husband ordered a dessert we had trouble pronouncing, the vinarterta. 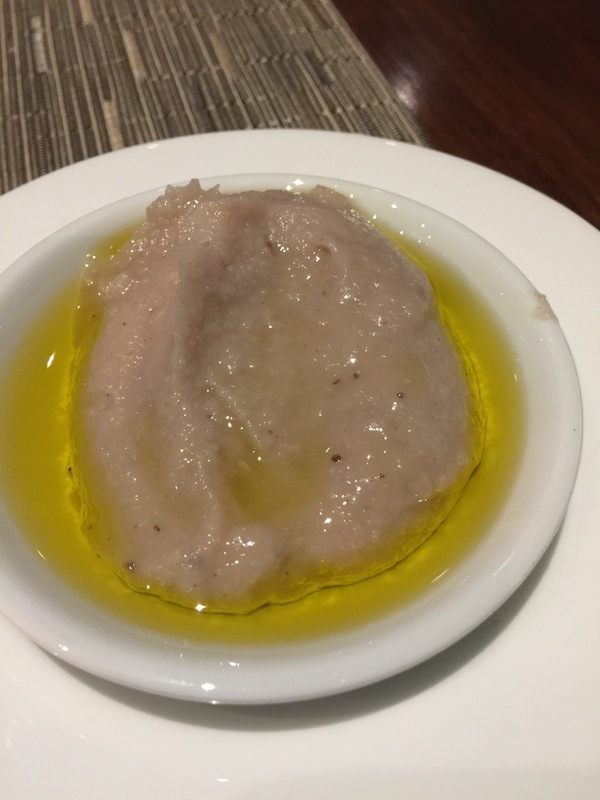 Luckily, our waiter put on his best Italian accent and told us that the vinarterta was certainly the most fun dessert to try to pronounce along with being his personal favorite dessert. The vinarterta consisted of wild blueberry compote, mustard ice cream, and rosemary birch syrup jelly. I think it was the mustard ice cream that really intrigued my husband, combined with wild blueberry compote, he just had to have it. With a description in the menu that starts off with mustard ice cream, it was the first ting on this beautifully plated dessert that my husband decided to try. Personally, I expected that mustard ice cream would be tangy, much the way mustard powder is when you add it as a seasoning into your cooking, however, after one spoonful of the ice cream, my husband told me I had to try it because it was completely the opposite of what he expected it to be. And sure enough, the mustard ice cream was sweet and delicious, and had you not told me it was mustard ice cream, I don’t think I’d ever guess what the main ice cream flavor was. It was rich and smooth and creamy with a hint of sweetness that spoke to a unique ingredient, but one you would never expect from mustard. The dessert was deemed to be “very good” by my husband who that the combination of the ice cream and the wild blueberry compote blended together very well. 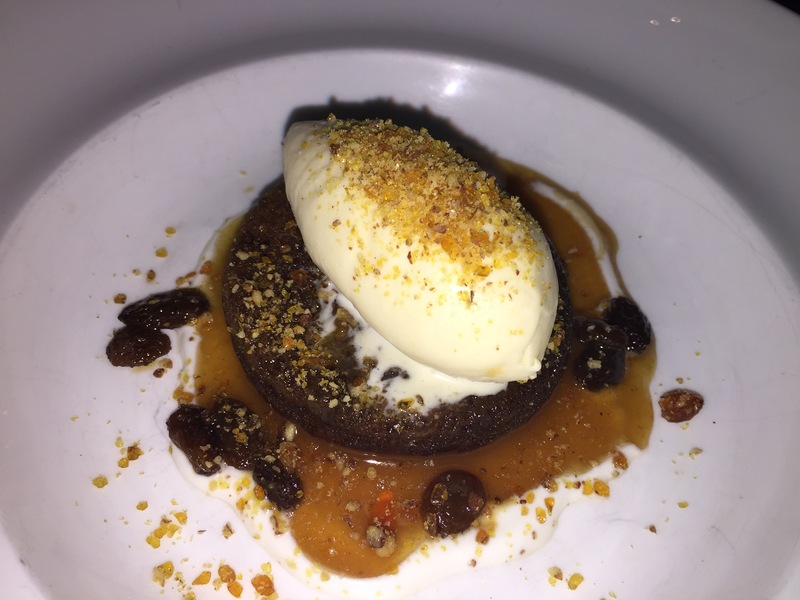 The cake was light and fluffy and mild enough to soak up the flavors of the ice cream and the blueberry and the rosemary birch syrup which helped give the dish a very woodsy, fresh flavor. My husband was more than satisfied with his dessert choice. Canoe was a culinary delight. With ingredients and dishes that highlighted the culinary style of Canadian cooking and flavors, we were taken on a food journey through this intriguing and diverse country. 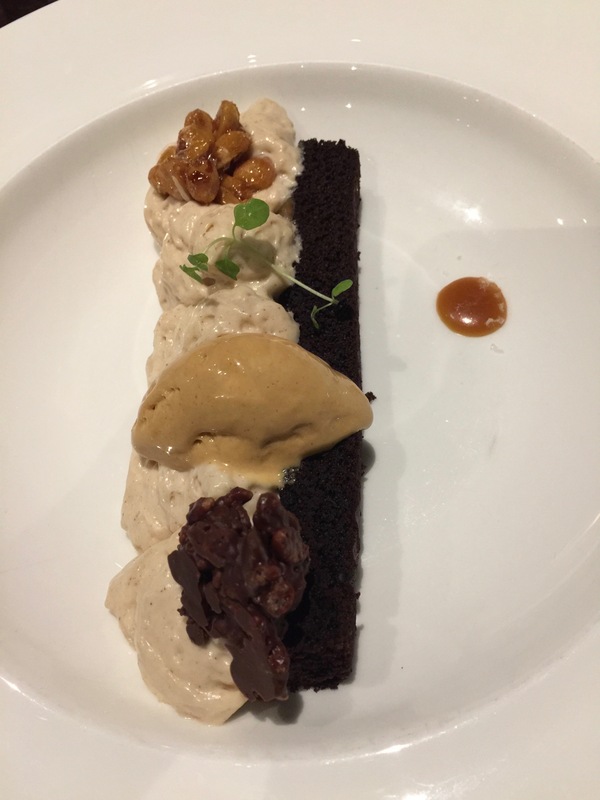 The level of creativity served to us amongst dishes such as s’mores foie gras and mustard ice cream, it was lovely to see that these flavors actually did work and that the beauty of the plating actually translated to amazing food to fill our bellies. 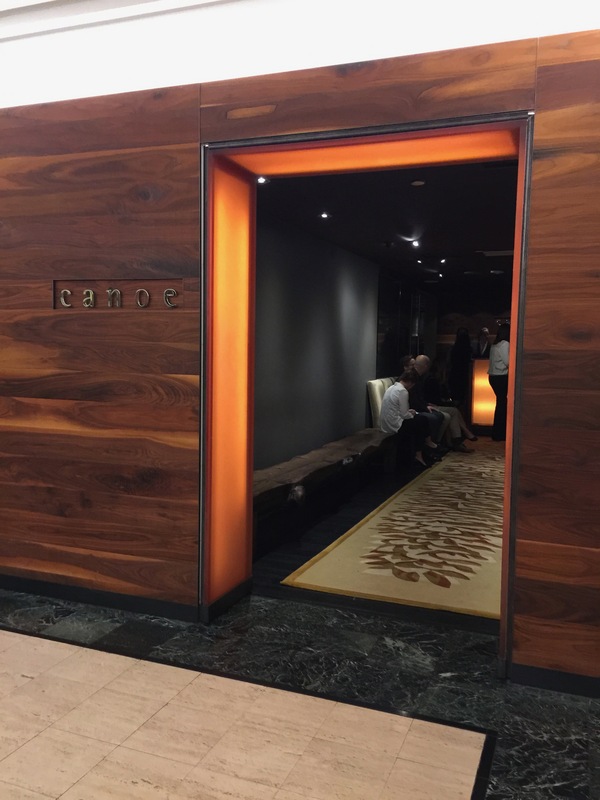 With a beautiful setting right in the heart of downtown Toronto, it’s easy to see why Canoe is one of Ontario’s, and Canada’s, most distinguished and highly acclaimed restaurants. 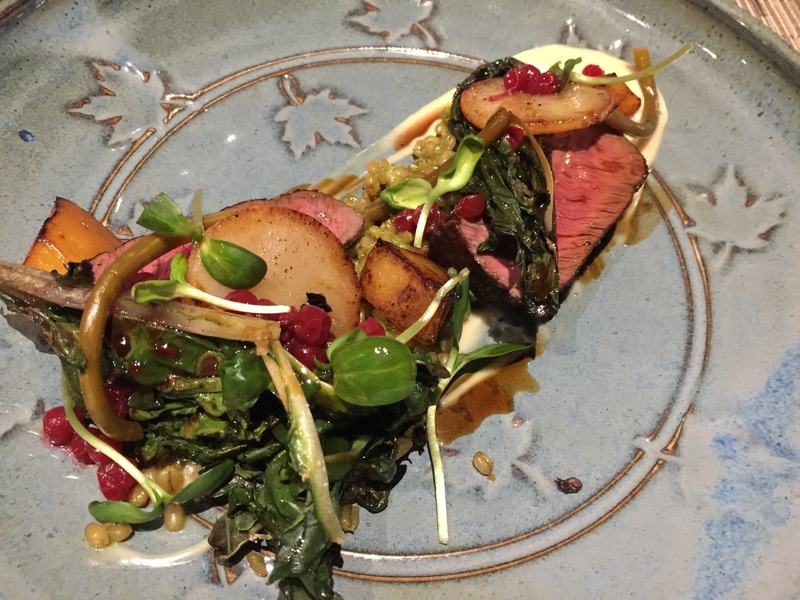 If Canoe is a representation of Canadian cuisine, sign me up for both the creativity, beauty and flavors. I’d definitely recommend Canoe to anyone looking for a nice meal when they come to Toronto. 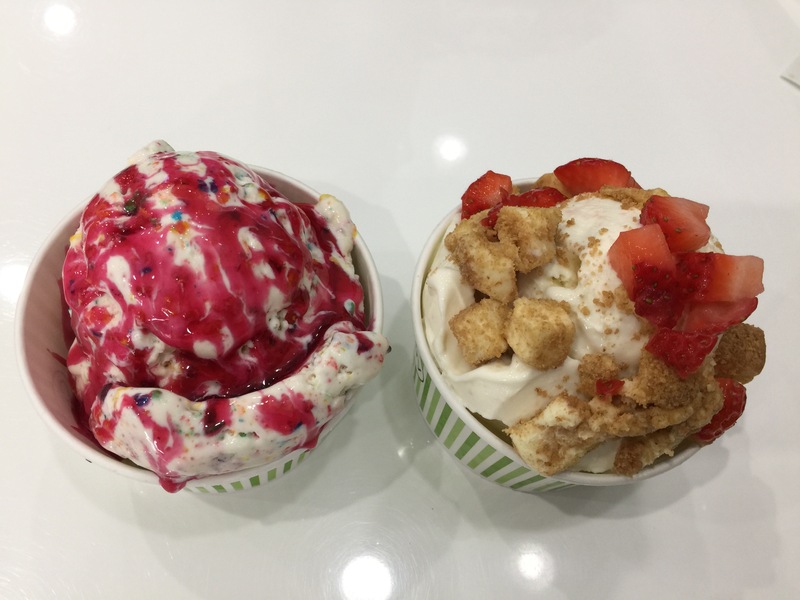 By now, if you’ve been keeping up with my blog, you’ll know that I am a huge sucker for ice cream. I feel, sometimes, that I live, eat, breath and dream about ice cream. I think about when I’m going to have more ice cream, I select flavors of ice cream in my dreams, I think about how eating ice cream makes me feel. Pretty much, I’m crazy for ice cream. I’ve always joked with people that there are two food items I would never say no to, and that is ice cream and chocolate. So, last year, when a new ice cream joint opened in our neighborhood, I told my husband right away that we needed to check it out. I’m embarrassed to say how many times we’ve been there since that first visit. 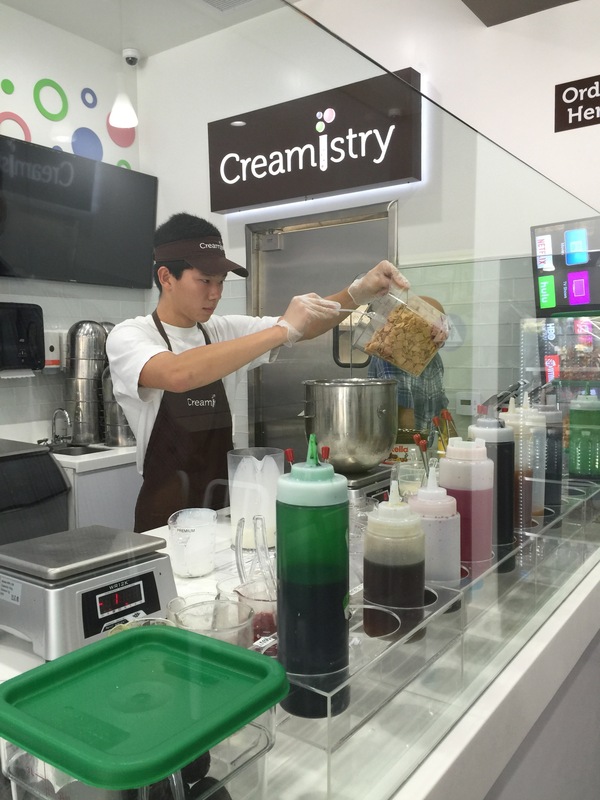 Creamistry is a new-age, hi-tech ice cream joint that starts off with the basic ice cream ingredients of cream and flavoring, combined it with gastronomy gadgets such as liquid nitrogen, to create your very own customized ice cream creation. 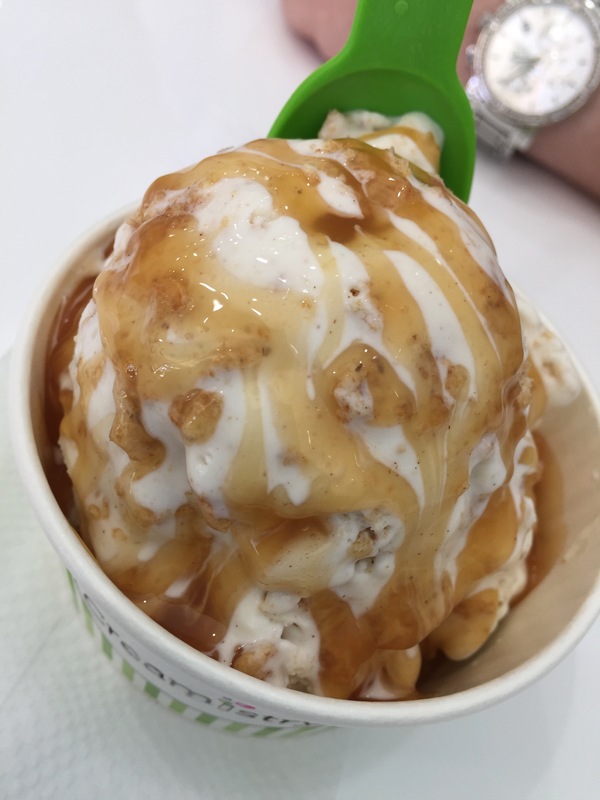 Nothing is made until you order it, and then you can watch as the ingredients and flavorings you chose are combined together in a mixing bowl with liquid nitrogen until it forms the perfect scoop of creamy, delicious ice cream. Half the fun is watching the “creamologist” use the liquid nitrogen and gaze upon the amount of frozen ice clouds that coming streaming out of the mixing bowl, onto the counter, and out into the store. 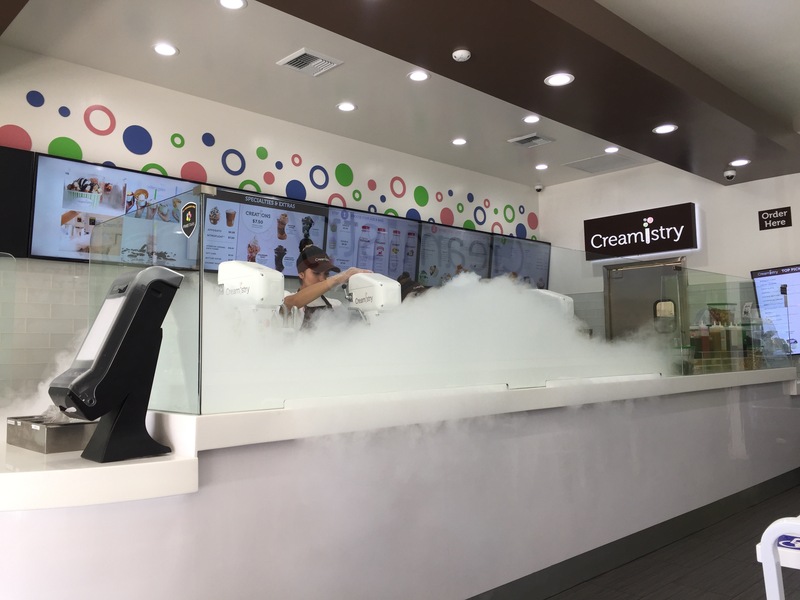 There are three steps to making your customized, made-to-order liquid nitrogen ice cream creation. The first step is to choose your base. There are four different ice cream bases that you can choose from to create a small cup, large cup, or a shake. The base creates that base layer that will be used to ultimately flavor your ice cream. The base that my husband and I have always chosen is the signature premium cream. It is described as being “rich and indulgent” and is the creamiest of all of the 4 ice cream bases. There is also an organic cream version made with 5 simple ingredients and USDA certified as 100% organic, kosher and non GMO. Of course, if you don’t want rich, and creamy and full-fat, or if you aren’t looking for a dairy-based dessert, there are a couple of other options for bases. There is a sorbet base which is non-dairy, water based base used to make fruit sorbets in a limited number of flavors which include: blood orange, green apple, mango, pineapple and pink grapefruit. Or there is a coconut milk base that is a non-dairy, vegan base that is also lactose, gluten and egg free for a healthier, non-dairy cream dessert. Step two is to choose your ice cream flavoring. The flavoring you choose gets added to the base you chose into a mixing bowl. These two simple ingredients together combine to create the flavor of your ice cream. There’s a wide variety of different flavors to choose from in various categories. There’s your traditional flavors of caramel, chocolate, French vanilla, Madagascar vanilla bean, and mint. There is the ever kid-popular flavor of cotton candy. And there’s the hip new option of salted caramel. There are various nutty flavors, all which go well with the coconut base such as coconut, nutella, pure roasted pistachio, Reese’s peanut butter and taro. There’s a cookies and cake category that includes birthday cake, cheesecake, cookie butter, Oreo, and tiramisu. There’s fruity flavors such as black cherry, fresh banana, strawberry and strawberry milk. There’s coffees and teas such as espresso, matcha green tea, milk tea and Thai tea. And there’s the very popular cereals category which includes Cap’N Crunch, Cinnamon Toast Crunch, Cocoa Puffs, French Toast Crunch and Fruity Pebbles. Being creatures of habit, I’ve tried the Cinnamon Toast Crunch, fresh banana and espresso. And while some of the other flavors such as tiramisu and strawberry sound really good to me, I can’t get myself to switch to other flavors as the ones I’ve made have been so tasty. My husband has always stuck with either Cinnamon Toast Crunch or Fruity Pebbles. And yes, they really do put actual cereal into a bowl with your chosen base. And while you may think that doing that may make for soggy cereal, it’s amazing how the end result turns out. The mixing bowl is attached to a stand mixer that has a special hook up for the liquid nitrogen, and then, as they say, the magic happens. The stand mixer is turned on, some liquid nitrogen is added slowly while the mixer is still going and all the ingredients combine together. The reaction of the liquid nitrogen mixing with the liquid base of the ice cream creates this cloud of cold gas that fills the countertops, much the way dry ice reacts when it comes into contact with liquid. The liquid nitrogen freezes the base and flavoring component immediately and within minutes creates ice cream! It’s such a simple concept, and an amazing process. The final step is for the Creamologist to scoop the ice cream out of the mixing bowl and into a cup. 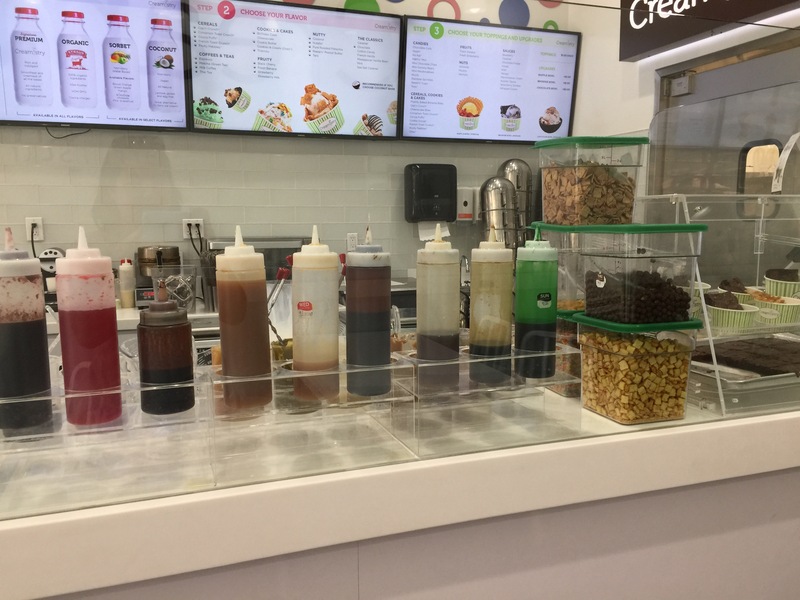 This is also the last step in your customized ice cream creation as you can now add as many, or as little, toppings as you want to your ice cream. The toppings can be mixed into the ice cream, so therefore before the ice cream is scooped out of the mixing bowl, the topping is added and everything is mixed together, or it can be placed on top of your ice cream scoop. The possibilities are endless and the toppings are numerous. Toppings include chocolate curls, Heath, Kit Kat, mini M&’s, mini chocolate chips, mini gummy bears, mini marshmallows, mochi, rainbow sprinkles, Reese’s cups, Twix, fresh baked brownie bites, Cap’N Crunch, cheesecake bites, Cinnamon Toast Crunch, Cocoa Puffs, cookie dough, French Toast Crunch, Fruity Pebbles, Oreo, fresh banana, fresh strawberry, almonds, pecans and walnuts. And of course, it wouldn’t be ice cream if you couldn’t top it off with whipped cream, strawberry sauce, chocolate fudge, caramel, kiwi, honey, blueberry sauce, mango, Nutella and marshmallow sauce. There are so many combinations you can make. Unsure, the first time around, I had a hard time deciding what I wanted to order so I stuck to flavors that I knew and was familiar with. I chose the espresso flavored syrup with the signature premium base and asked for bananas to be mixed into the ice cream as my topping. The espresso syrup combined with the signature premium base created a very creamy and delicious ice cream. It was thick and rich and absolutely amazing. I loved it. 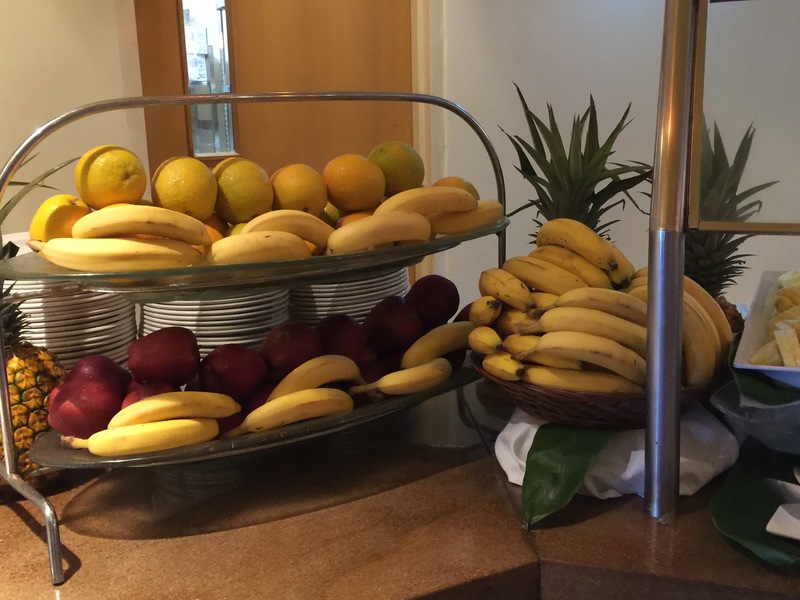 And while you may think that bananas and coffee don’t go together, I’d beg to differ as bananas go with any flavor possible. And for me, this was a perfect pair. 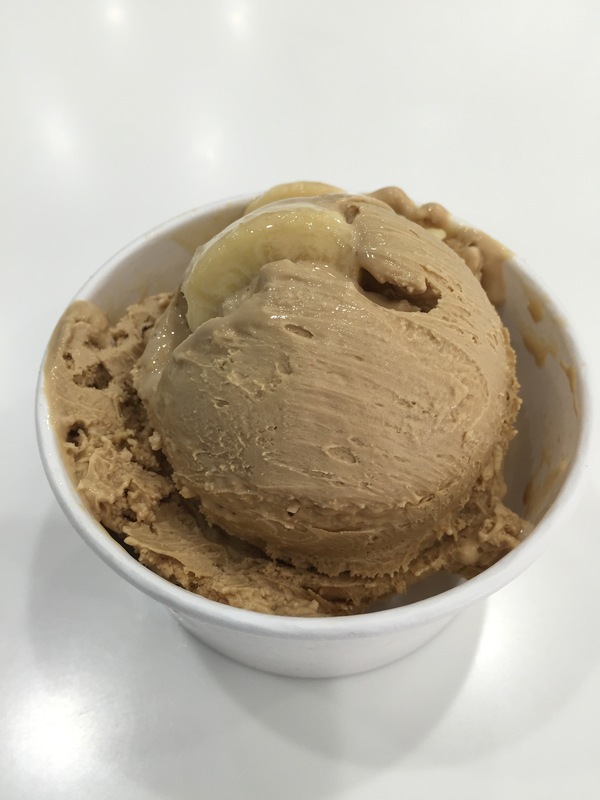 Fresh banana slices mixed right into fresh made espresso ice cream, it was a winner! My husband, decided to be a little more adventurous that me and wanted Cinnamon Toast Crunch added to his signature premium base and then topped with caramel sauce. Again, my first thought was, “cereal added to cream? Ew, wouldn’t that just make it soggy?” But I couldn’t be more wrong. Sure enough, actual Cinnamon Toast Crunch cereal was added directly into a mixing bowl with signature premium ice cream base and mixed with liquid nitrogen to form ice cream. Surprisingly, the cinnamon toast crunch cereal was crunchy and cinnamon-y and delicious. The mixture with the cream was perfect and again, created very creamy and smooth ice cream. The caramel sauce added just the touch of sweetness the ice cream needed. My husband really liked the texture and creaminess of the ice cream. The texture and the smoothness and thickness that you can achieve with just the combination of the creamy base and the liquid nitrogen is amazing. It looks like ice cream, and taste luxurious like good quality ice cream. 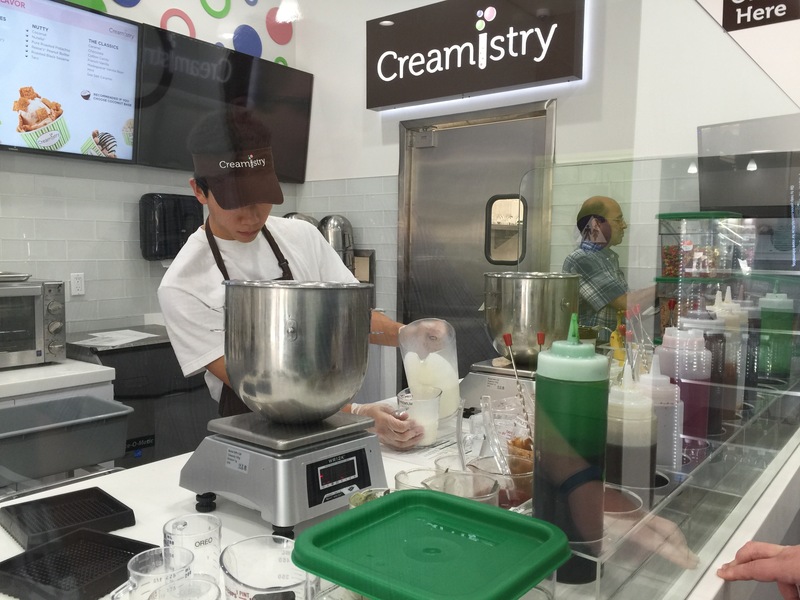 As I’ve said, since our first visit to Creamistry, I fell in love with it and my husband and I have been back numerous times. Occasionally, we’ve both even tried different flavors and combinations. I’ve had fresh banana ice cream topped with fresh strawberries and cheesecake bites. What’s a better combination and strawberries and banana? Again, you have to understand how much I love bananas. Banana ice cream is just up my alley, add fresh bananas and mix it in with signature premium base to create a flavorful, creamy ice cream. Add fresh, ripe strawberries and small cheesecake bite squares, and it added sweetness, tanginess and richness to a fantastic cup of ice cream. My husband has mixed up the Cinnamon Toast Crunch cereal with Fruity Pebbles instead as he wanted something colorful and different, so he topped his creation with blueberry syrup. I think he liked this combination even more than the Cinnamon Toast Crunch ice cream as this was crunchier and more colorful and more flavorful whereas the Cinnamon Toast Crunch was just cinnamon-y. And of course, blueberries are my husband’s favorite fruit, so the blueberry syrup is the perfect topping for his fruity pebble ice cream. Since he switched it up and left the Cinnamon Toast Crunch ice cream behind, I decided to get Cinnamon Toast Crunch ice cream myself instead of the banana ice cream and topped it with strawberries and cheesecake bites. That was also a fantastic combination as the cinnamon, the cheesecakes and the sweetness of the strawberries creates a filling and delicious ice cream combination. 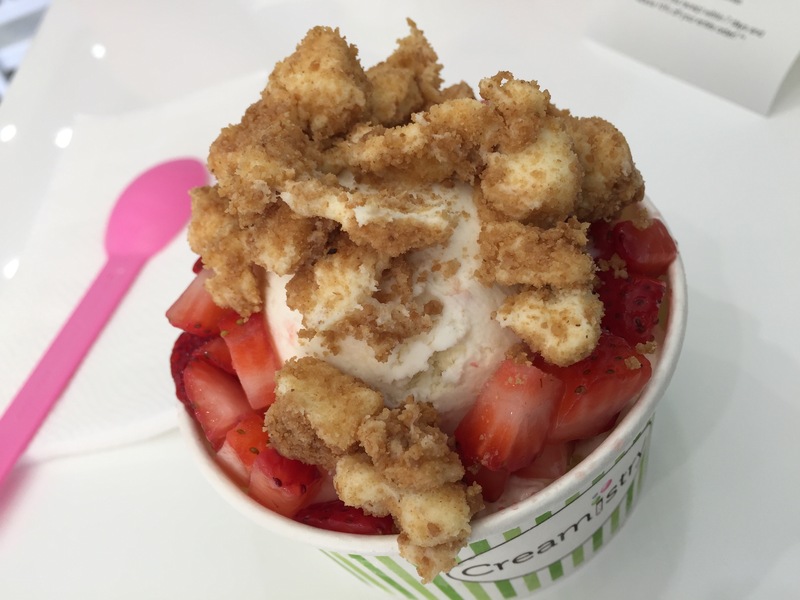 There are thousands of combinations that you can create at Creamistry, from mixing up ice cream flavor combinations to mixing up the toppings. You can even make milkshakes, affogatos, or have a brownie sundae or your ice cream put into a waffle bowl. The combinations appear to be limitless. Who knows, maybe one of these trips, my husband and I will be willing to mix it up again and try different flavors and different combinations. Although, right now, I think we’ve been perfectly happy with the combinations we’ve created so far. 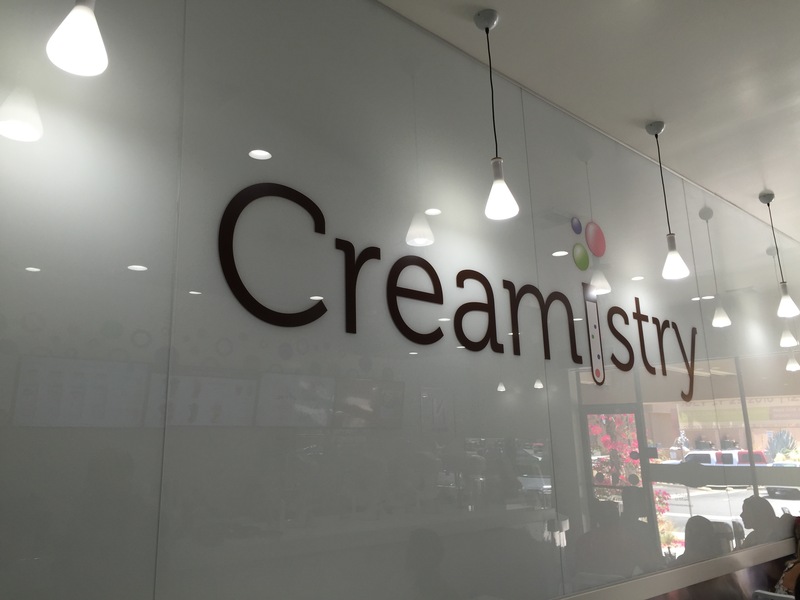 And we’ll continue to go back to Creamistry again and again. During our last full day in Maui, we decided to do the Road to Hana drive. Starting out early in the morning, we headed down towards Hana. One of the last little towns you drive through before you actually start the Road to Hana is Paia, which is more of a little hamlet than an actual town. 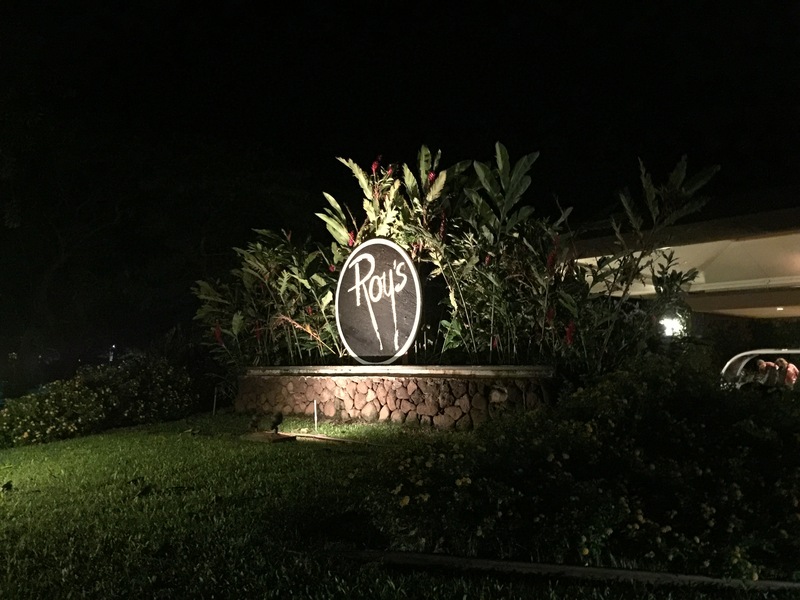 But one thing we noticed while we drove through Paia was a restaurant that we had on our short list of places we wanted to try while we were in Maui. After many hours on the road traversing down to Hana, we decided to turn back at the end of the road and come back the way we had come rather than risk going the long way around over the dirt road to get back towards Ka’anapali. Since we were coming back towards Paia, and we hadn’t stopped to eat all day, we decided this would be the perfect time to stop in Paia for a late lunch/early dinner meal. Mama’s Fish House is a North Shore Maui institution. 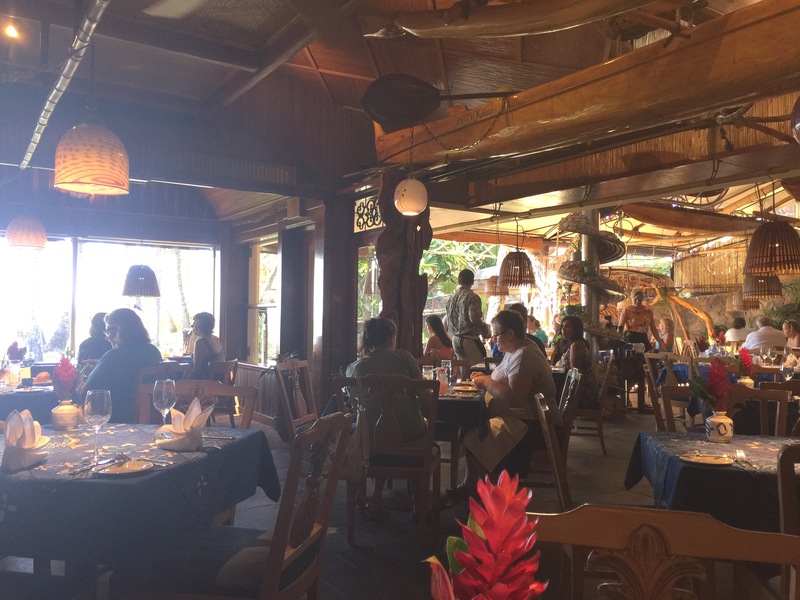 Often cited as one of the best restaurants in Maui, one of the best restaurants in Hawaii, and listed as one of the top 100 restaurants in the United States, Mama’s Fish House is world-renowned for its tropical Hawaiian flavors and the freshest fish on the island caught daily by local fisherman just off shore. The brainchild of Floyd and Doris Christenson from Southern California, they first visited Maui shortly after Hawaii had become the 50th state in the Union, and the island was so underdeveloped there was only one hotel on the whole island and you couldn’t even access Ka’anapali beach without cutting through thick groves of trees. Having visited Maui, they had fallen in love with island living and Polynesian culture and friends of them urged them to go and visit Tahiti and other South Pacific islands. Upon returning home to Southern California, the Christenson’s sought out a sailboat and learned how to navigate to prepare themselves for a journey that would take them from San Diego down to the far pacific reaches of the Marquesas Islands, Tahiti, New Zealand, New Caledonia and beyond. Setting out with their young son, and giving birth to a daughter along the way, the Christenson’s sailed themselves all over the South Pacific using nothing but rudimentary navigational equipment and then sun to guide their way. For Doris Christenson, during the time of their trip, unless the weather was bad, she always cooked and prepared a home cooked meal in the ship’s make shift galley. When they arrived at their various destinations along the way, Doris met and befriended locals, gathered local fruits and vegetables and learned local cooking techniques which she would then perfect and experiment with on her family. After some time sailing the South Pacific, the Christenson’s decided that if they were ever to make their dream of owning a restaurant come true, they would do it in Maui. Reports from friends had told them that Lahaina was growing and the tourist industry was about to explode in Maui. Ka’anapali beach was finally accessible and major hotel chains were being built. So the Christenson’s returned to Maui, bought the property in Paia where Mama’s Fish House stands today and opened up shop determined to serving only the freshest fish possible from local fisherman and fresh organic produce grown right on the island of Maui. The restaurant featured a lovely, and very large, open air dining room. 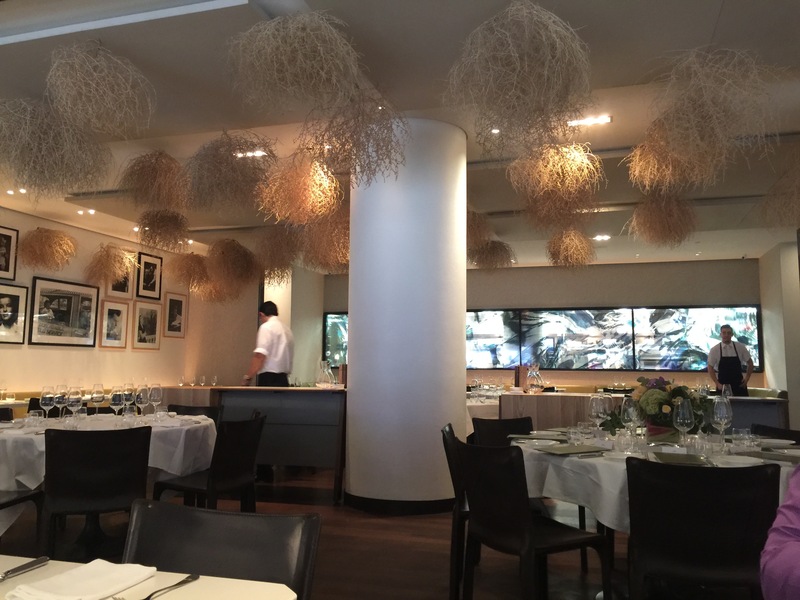 In fact, the restaurant is so large that there are several separate and distinct dining areas. Each dining area had tables that faced out towards the front of the restaurant and the private beachfront just beyond the restaurant. With windows that were completely open to the outside, you could just sit and enjoy watching the shady palm trees sway in the cool afternoon breeze while you listed to the surf lap up against the sand. It was all quite relaxing and comfortable and welcoming, despite the fact that the restaurant was actually quite busy. A day of driving the curving, mountainous roads of Hana, we were definitely ready to relax and kick back. So we decided to start our meal off with a couple of drinks. The drinks which were appropriately presented with paper umbrellas to cap off that tropical vibe. Admittedly, these were the first paper umbrella drinks we’d been served our whole time in Hawaii, so while kind of kitschy, it was quite nice. I ordered the strawberry guava fizz made with strawberry guava mixed with lemonade and a splash of soda. I loved the fizz of the drink, and fizz really was an appropriate word. The guava nectar tasted spectacular, but when does guava not taste good? It really is the signature flavor that reminds me of Hawaii. But it was the strawberry flavor in this drink that added the hint of sweetness that the drink needed to mix with the flavor of the guava and the slight tartness of the lemonade. My husband decided to order Aunty Karen’s Lemonade. Made with lilikoi, kula lemon and cranberry juice with mango, this was a pretty drink. 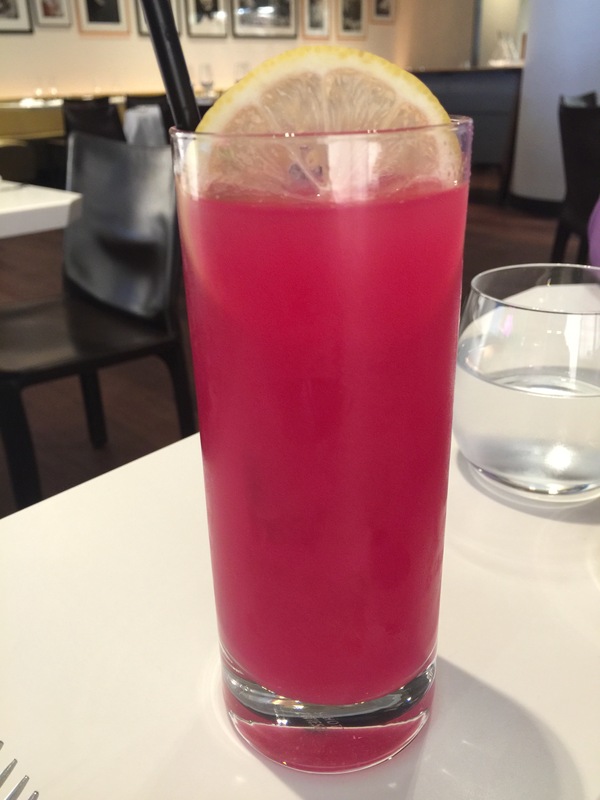 Unfortunately, my husband thought that the drink tasted a little bit too much like pink lemonade and he had trouble tasting the lilikoi and the mango over the sweetness of the lemonade and cranberry juice mixture. 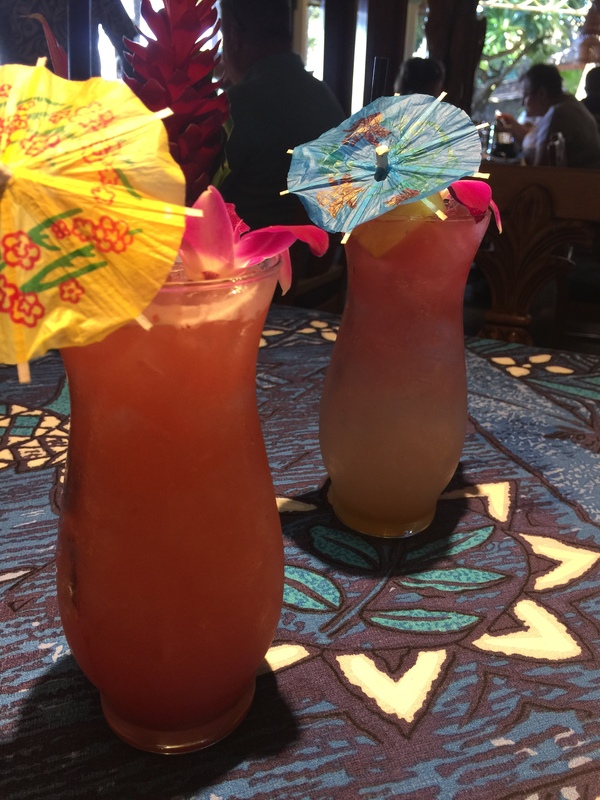 My husband expected with the flavors mixed into this drink that it would be a little bit more tropical in taste, with more of the lilikoi flavoring coming through. Before our appetizers and entrees were brought out, we were presented with the chefs compliment starter of a small cup of asparagus bisque. The soup was quite delicious with a very smooth pureed taste. You could certainly taste the fresh, earthy flavor of the asparagus in the bisque which was accentuated with some chopped parsley. 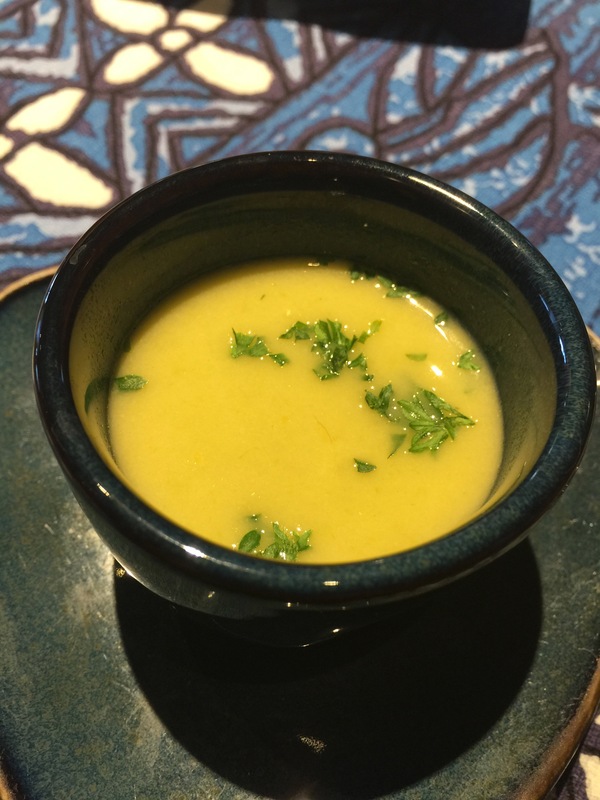 At first, I wasn’t particularly thrilled with the idea of asparagus bisque, but it actually turned out to be quite tasty and a terrific item to whet our appetite. 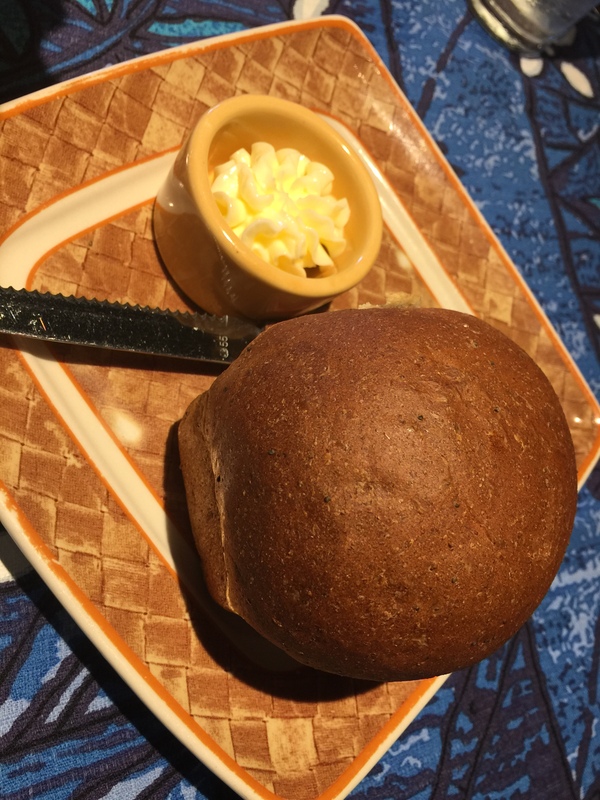 In addition to the asparagus bisque, we also received the traditional bread basket, although this time it was a loaf of poppy seed bread made with local honey. The bread was terrific and my husband and I devoured the whole thing in seconds. 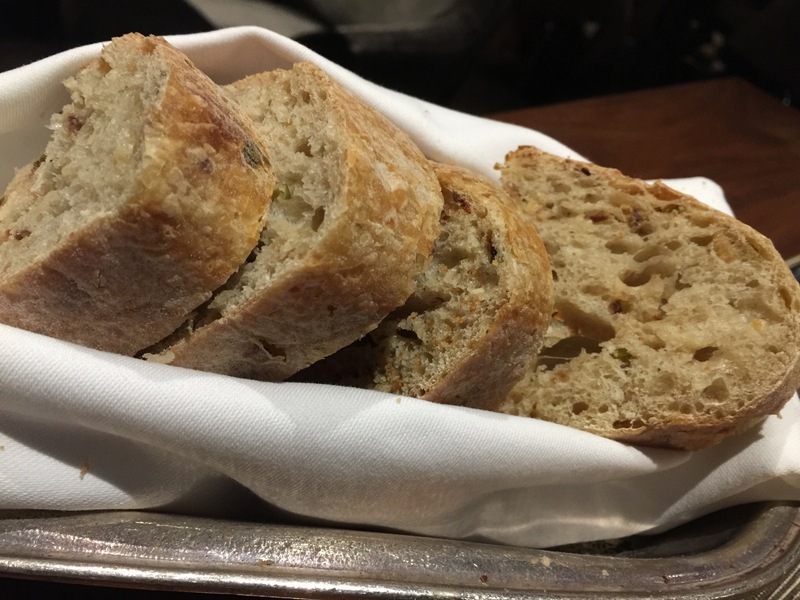 It very much tasted of a loaf of wheat bread with just the right touch of honey which added enough sweetness to the bread to give it some depth of flavor. As we were starving and hadn’t eaten anything all day, we decided to order two different appetizers. Our first dish was the Kauai shrimp won ton with macadamia nut dipping sauce. This was fantastic. The shrimper nice and large, and the won ton wrappers were perfectly fried to a crisp golden brown. The sweetness of the shrimp was only offset by the sweet and sour tang of the macadamia nut dipping sauce which was a terrific contrast to the sweet and crispy shrimp. And as an added bonus the cabbage slaw upon which the crispy fried shrimp were sitting atop was quite delicious and tasty with a bit of a seasame oil dressing. This appetizer was my choice and I was quite pleased with it. 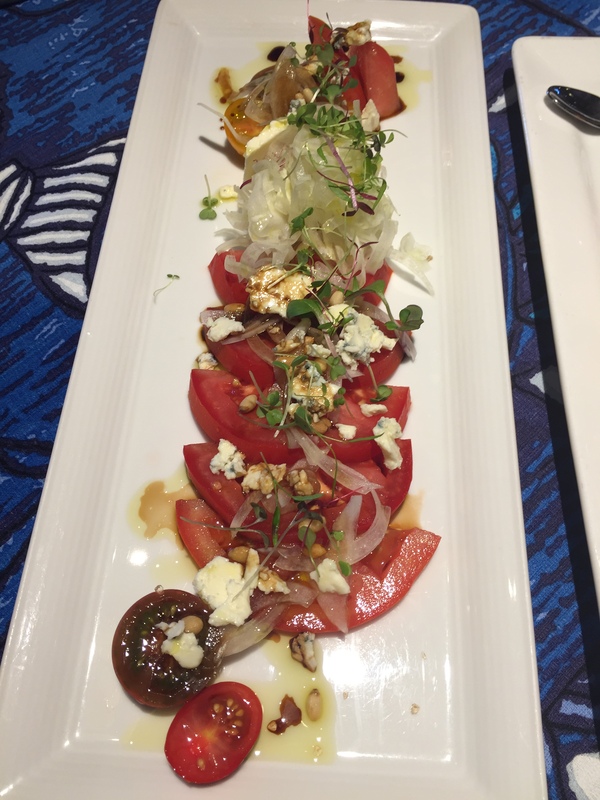 My husband, for his choice of a starter choice the Maliko Bay tomato and Maui onion salad with pine nuts and Point Reyes blue cheese dressed with Maui olive oil and 18 year aged balsamic. And while this dish sounds a bit like a caprese salad, it sort of is, but with a Hawaiian flair. Honestly, I wasn’t expecting all that much from this dish, but Mama’s Fish House proved me completely wrong. After his first bite of this dish, my husband’s first words were “Wow!” The use of the Point Reyes blue cheese was fantastic and gave the contrasting flavor in this dish that balanced out the sweet tomatoes and sweet onions. The Maliko Bay tomatoes were terrific, perfectly ripe and nice and sweet with terrific flavor. 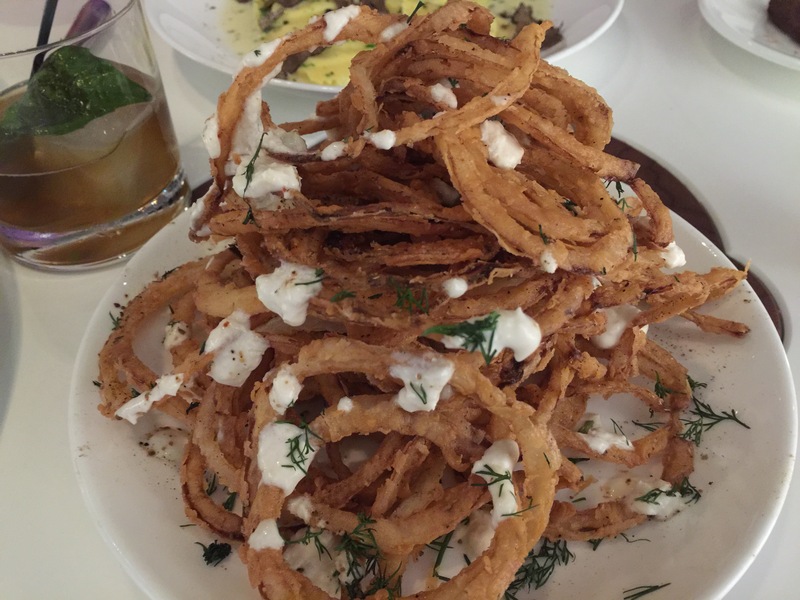 The Maui onion salad was also nice and sweet, as Maui onions are known to be. So instead of having an acidic and tangy salad, we essentially had a very nice and sweet salad offset by the tangy blue cheese. 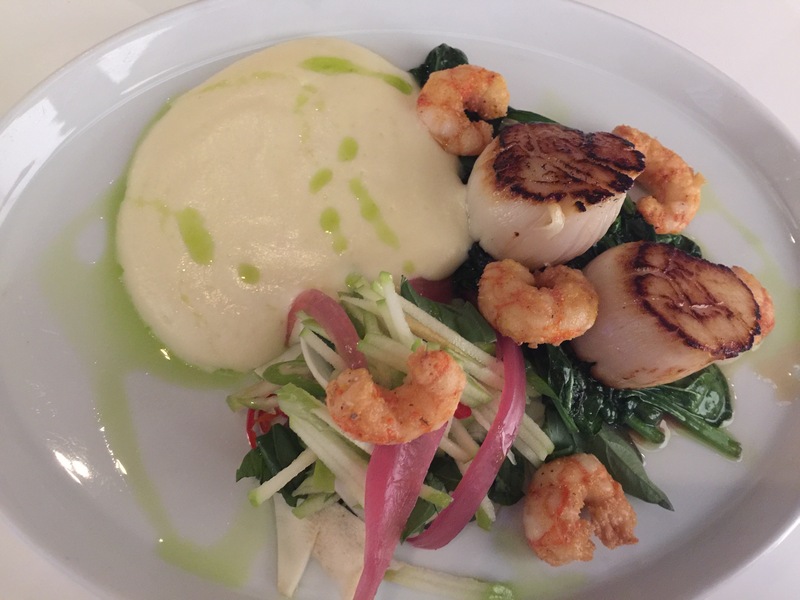 The Maui olive oil and the aged balsamic just added the right touch of acidity needed for this marvelous dish. For my meal, I chose to order the uku, which is a Hawaiian blue-green snapper. At Mama’s Fish House, to demonstrate that the fish is caught daily and is as fresh as possible, the menu actually tells you the name of the fisherman who caught the fish and where it was caught from. In this case, the uku was caught by Kalae Hickcox bottom fishing at 1,000 ft depths. Uku is a popular table fish in Hawaii as it has a reputation for having a moist, firm and delicately flavored, translucent pink flesh. With this uku dish, the fish was steamed with Hana ginger and sizzling peanut oil and served over a bed of local steamed vegetables and with a side of coconut steamed white rice. The fish was perfectly light and flaky and very well steamed. The flavor of the peanut oil and the ginger was completely infused into the fish and the vegetables. The vegetables which included baby bok chop were fabulously light and a perfect compliment to the fish. 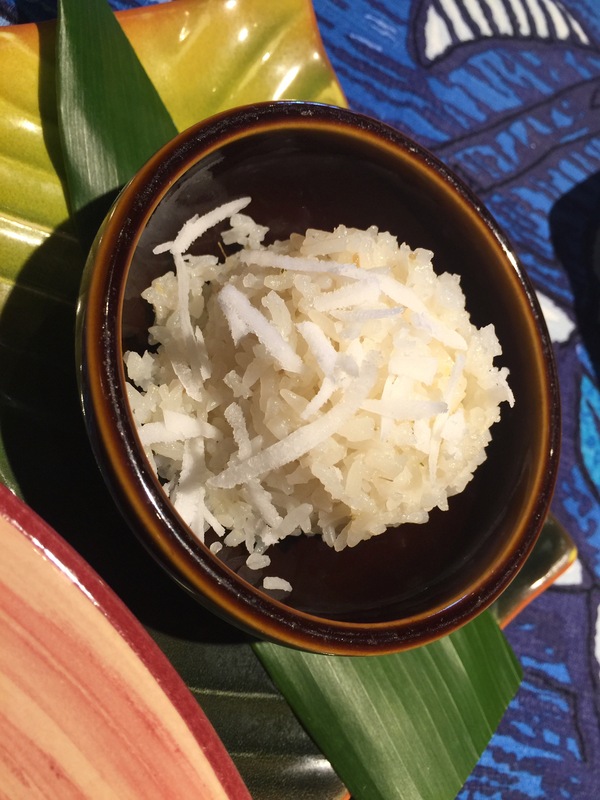 And the coconut steamed white rice was terrific and was the starchy side this dish needed. The two filets of fish served with the dish were huge and definitely filling. My favorite part of the meal was definitely the beautiful and slightly salty peanut oil and ginger sauce combination. After not having eaten all day, this meal perfectly hit the spot for me. My husband, for his meal, chose Mama’s Fish House’s signature dish of mahimahi stuffed with king crab and baked in a macadamia nut crust. As with my uku dish, the menu described that this mahimahi was caught by Mike Fisher trolling through the Alenuihaha Channel. The fish was served atop some lemongrass rice pilaf which my husband quite enjoyed. The rice had a great light lemongrass flavor which my husband could definitely taste. The combination of the mahimahi with the king crab was a fantastic combination and very well prepared. The sweetness of the crab meat with the flaky fish made for a good flavor combination. The fish itself was nice and light, so this wasn’t a heavy meal at all, even though it seemed as it though it might be a heavy meal. 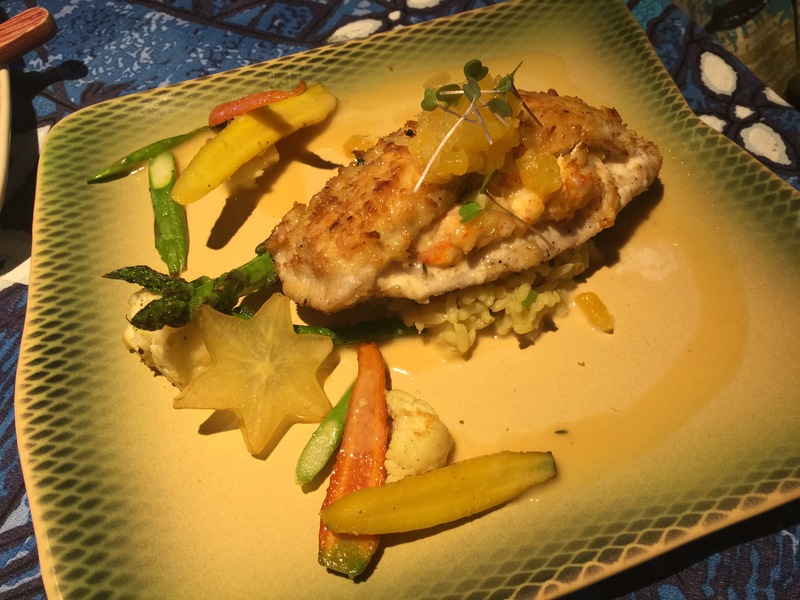 There was a light pineapple salsa topping the mahimahi and the sweet and tang of the pineapples also added to the flavor profile of the fish. The steamed baby vegetables served as a side was also a nice treat to go with this fish dish. But the star was definitely the fresh mahimahi. My husband was quite pleased with this dish and was glad he decided to order it. 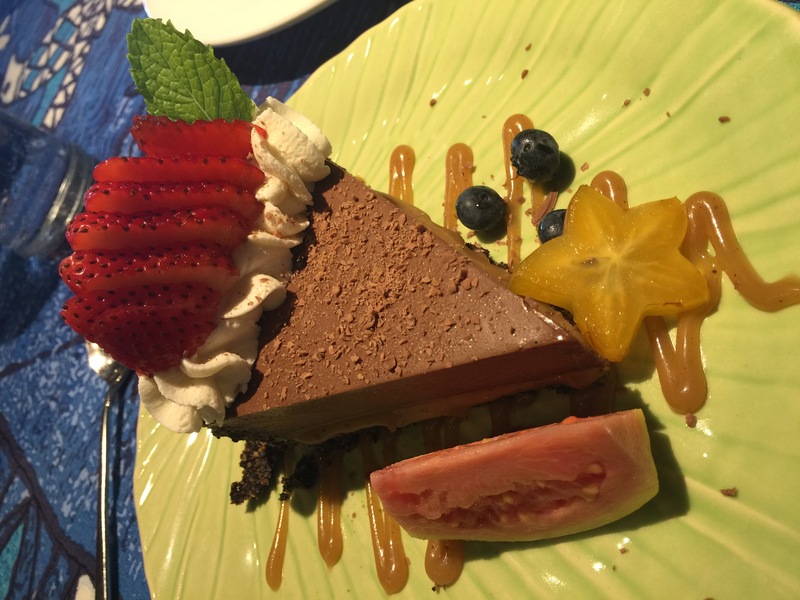 While we’d already eaten quite a bit, my husband and I really had worked up an appetite on our explorations and had decided that we could each afford to order our own desserts. For me, I couldn’t help but choose the Kauai chocolate pie which was baked in a caramel cookie crust. Seemingly like a chocolate mousse pie the filling was smooth and delicious without being overly sweet. The caramel cookie crust was fantastic and gave the pie a crunchy texture which worked well with the smooth chocolate mousse filling. Atop the cookie crust was a thin layer of caramel spread over the cookie crust so that when you brought up a forkful of pie, you got chocolate mousse filling, caramel sauce and the cookie crust. The pie was topped with fresh whipped cream on the edges and slices of ripe, delicious strawberries. Also decorating the plate were fresh blueberries, star fruit and guava. The Kauai pie tasted a little tropical, a little sweet, and a whole lot of good. The pie was also very nice and light, which meant that I didn’t feel stuffed by the end of the meal. For his dessert, my husband ordered the Polynesian black pearl. Honestly, this may have been the prettiest dessert I’ve ever laid my eyes on. In fact, it was so pretty, I almost felt bad that my husband was about to devour it. The menu described the dessert as being liliko’i chocolate mousse in a pastry seashell. But that’s such a simplistic description for what was an amazing dessert. The “shell” of the black pearl was made with a think cookie rounded to look like the shell of a pearl. 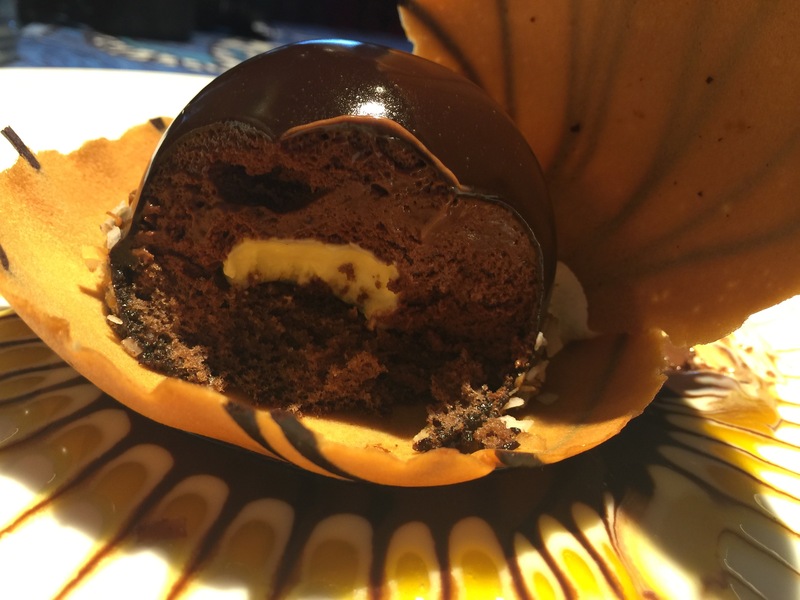 The “black pearl” itself was the chocolate mousse with the lilikoi center and then surrounded in smooth chocolate ganache so that the light glinted off it to shine like a black pearl might. 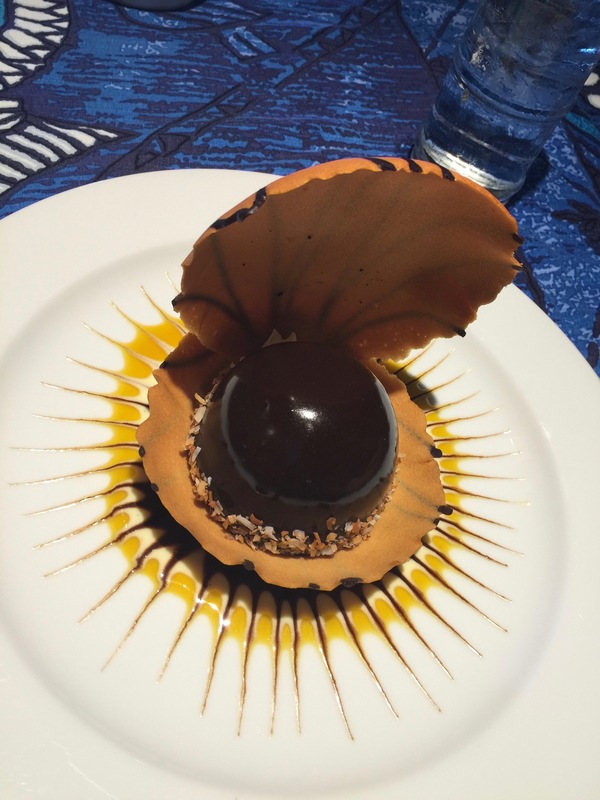 The entire shell and black pearl was set atop at bed of chocolate and lilikoi sauce artfully designed to look like light rays shining off the shell and accentuating the whole dish. It was absolutely gorgeous. But was even better was how delicious the dessert was. Honestly, it’s worth going to Mama’s Fish House just for the Polynesian black pearl dessert. 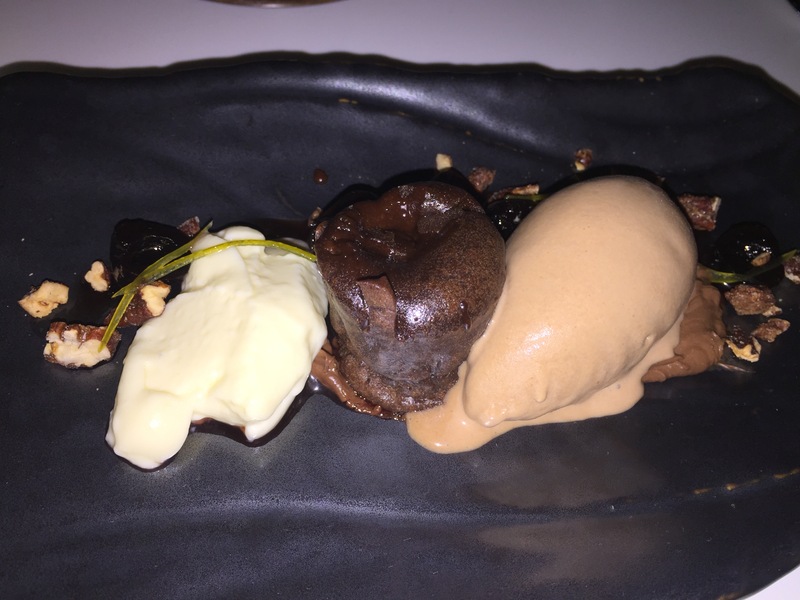 The mousse was absolutely smooth and delicious and finding the lilikoi center was a nice surprise to add a tangy bite to the chocolate mousse. The chocolate ganache added another layer of flavor to the entire dessert with the pastry cookie shell adding texture and crunch to the desert. The lilikoi sauce was heaven on the plate and really balanced out the chocolate dessert. My husband and I were both in love with the desert. Finally, as if we weren’t already stuffed to the gills, we were presented with a plate of homemade haupia. Haupia is a traditional coconut-milk based dessert that is found all over the Hawaiian islands. Traditionally, made with heated coconut milk and arrowroot starch, the two mixed together until it thickens and forms a gelatin-like dessert. Essentially, haupia almost has the consistency of coconut jello, but with much more depth of flavor. 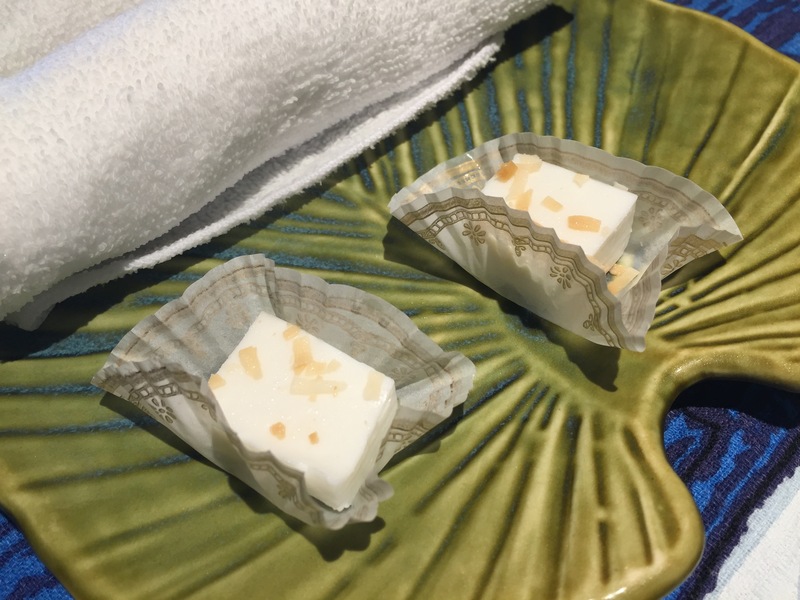 My husband and I loved the light coconut flavor to the haupia and despite the fact that the treat looked more like a nougat, it was nice and light and easy to enjoy, just like a small jello square would be. This was the perfect way to round out a delicious meal. As it turned out to be our only meal of the day, our late lunch, early dinner at Mama’s Fish House was the perfect ending to our quick Hawaiian getaway. After our meal, we took a quick walk around the restaurant’s private beachfront property and enjoyed the views of the Pacific Ocean just before the sun started to set. Feeling the ocean breezes, reliving our adventures on our drive on the Road to Hana as well as the lovely flavors of the meal we just enjoyed, this just felt so right. To be here in this moment at this time. Our meal at Mama’s Fish House just capped of our quintessential Maui day. Beautiful sights, jaw-dropping views for miles, and delicious, tropical, fresh food to fill our bellies. We really couldn’t ask for any more from this day, or our trip to Hawaii. Can’t wait until we find ourselves traveling back to Hawaii again to see what other adventures await us. 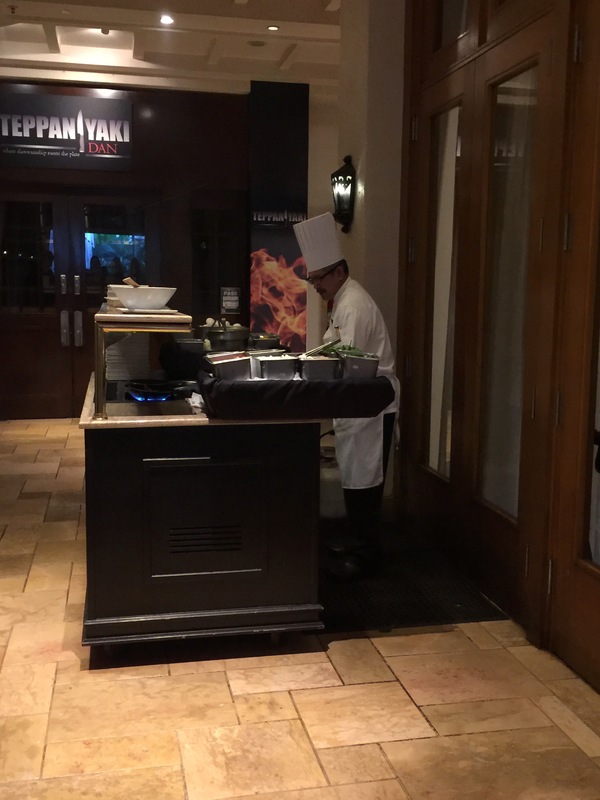 While in Maui, we stayed at the Sheraton Maui Resort & Spa at Ka’anapali Beach. We had a beautiful ocean view room with a gorgeous view of the famous Black Rock at Ka’anapali from where we could watch the nightly torch lighting and rock diving ceremony from the Black Rock at sunset. This black lava rock outcropping is one of Ka’anapali’s distinguishing features, a place that the local Hawaiian’s believed to be a sacred spot on the island, and the torch lighting and cliff diving is in tribute and honor to the local gods and spirits. 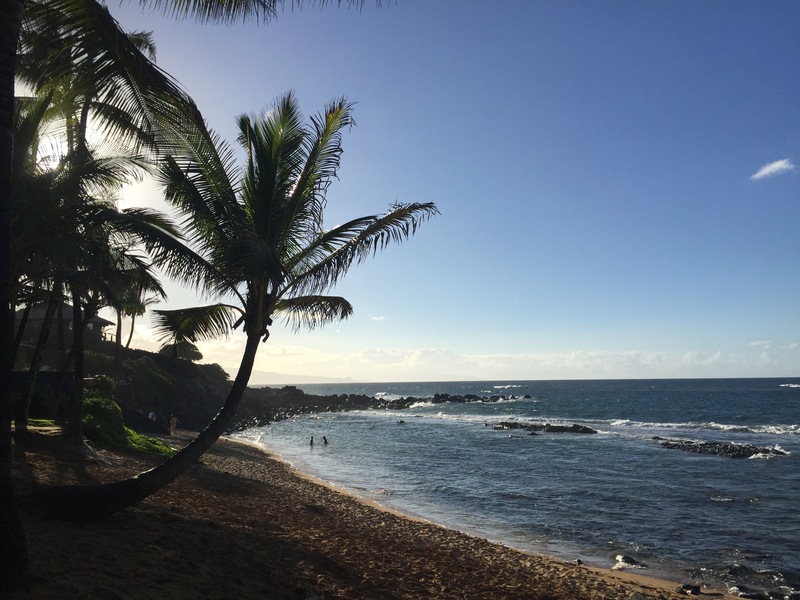 Located at the very end of the beach closest to the Black Rock, the Sheraton Maui Resort is primarily focused on and around the Black Rock itself. 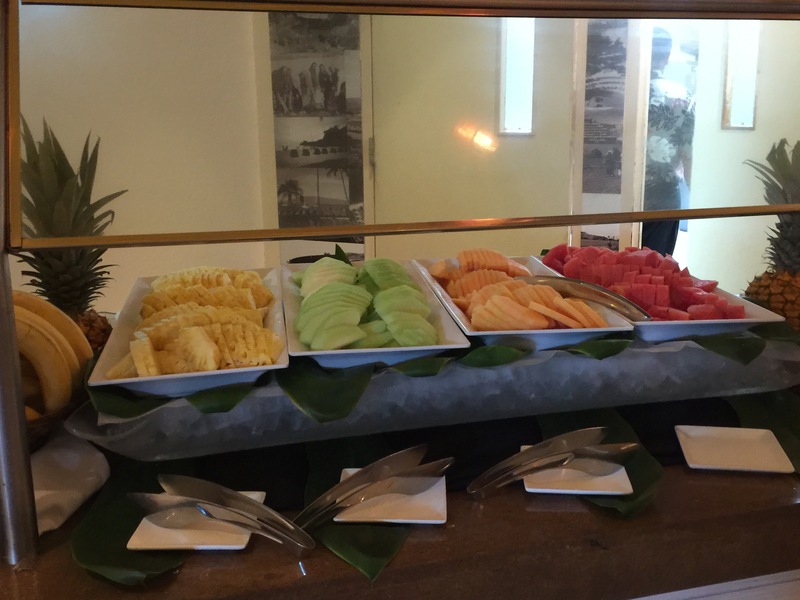 Each morning during our stay at the resort, we were treated to a bountiful buffet breakfast at the Black Rock Kitchen at the Sheraton Maui. As the name would indicate, the restaurant was located in the shadows of the beautiful black rock with both indoor and outdoor seating. The outdoor seating, just off the main pool area of the hotel provided wonderful views of the grounds of the resort, but also of the Black Rock that loomed over the property. 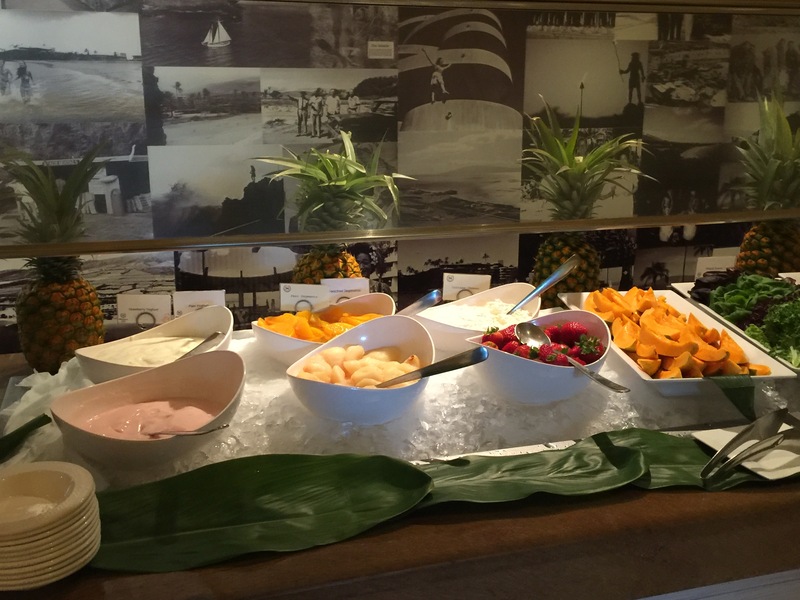 A gorgeous buffet spread, featuring some uniquely Hawaiian foods and flavors is just the wake up call we needed each day for our Hawaiian getaway. What is breakfast without your standard eggs, bacon and potatoes? Scrambled eggs, or hard boiled eggs were set out for everyone to pile high on their plates. Country potatoes with sautéed green peppers and onions as well as crispy, bacon provided the starch and salty fatty breakfast meat everyone needs to fuel up for the day. If bacon isn’t your thing, there was also grilled ham steaks, a vegetable quiche and of course stacks of buttermilk pancakes. For the pancakes, there was your traditional butter and maple syrup, but you also had your Hawaiian choice of coconut syrup for the tropical, sweet addition to the flappy jacks. Bread pudding with creamy creme anglaise as well as oatmeal was also on offer. 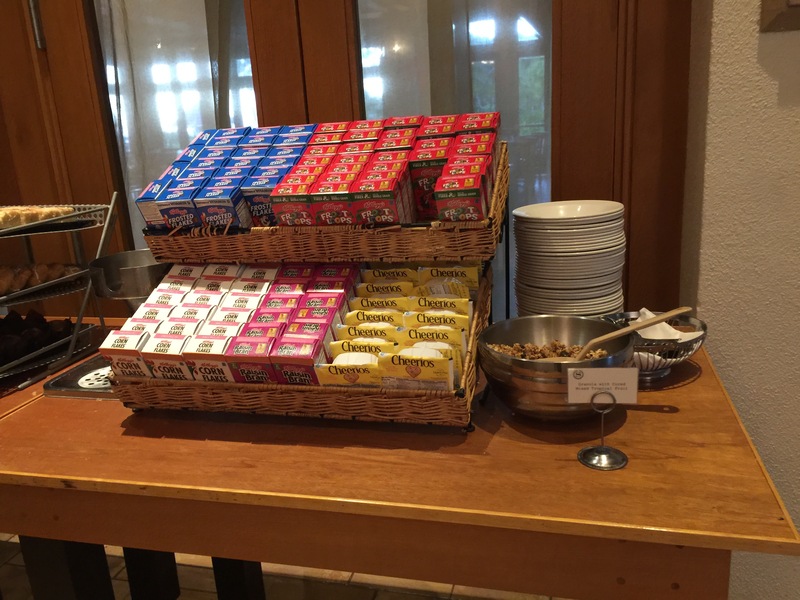 Of course you could also get an array of various boxes of cereal with milk, or start your morning off with a variety of toast and bread with bread and different flavors of jam. 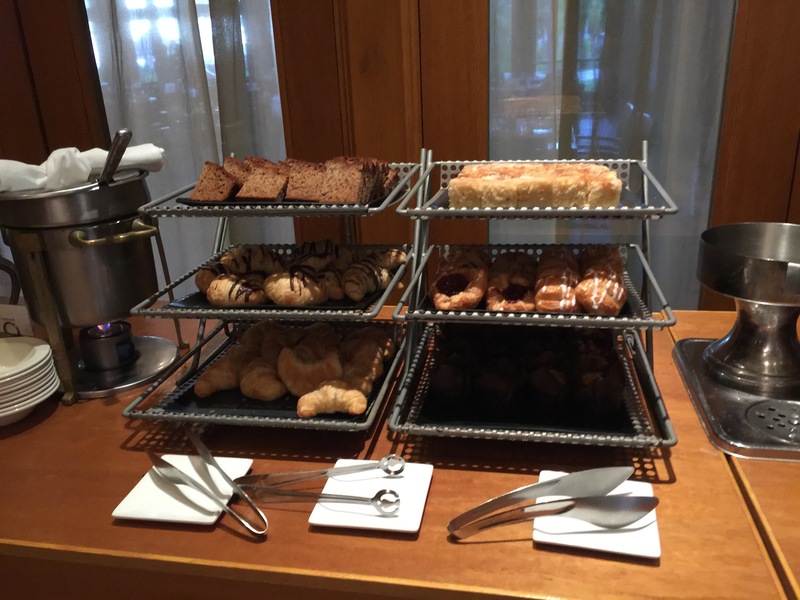 Or there was also a variety of different pastries and baked goods including various Danishes, fresh banana bread, which Maui is known for, croissants, chocolate croissants, bran and chocolate muffins, and even some sort of coconut cake. You could also get English muffins and bagels too with cream cheese. If you wanted cold cuts and smoked salmon instead to make a morning sandwich, you could do that as well. Accompaniments included thin sliced red onions, capers, sliced cucumbers, tomato slices and various spreads. 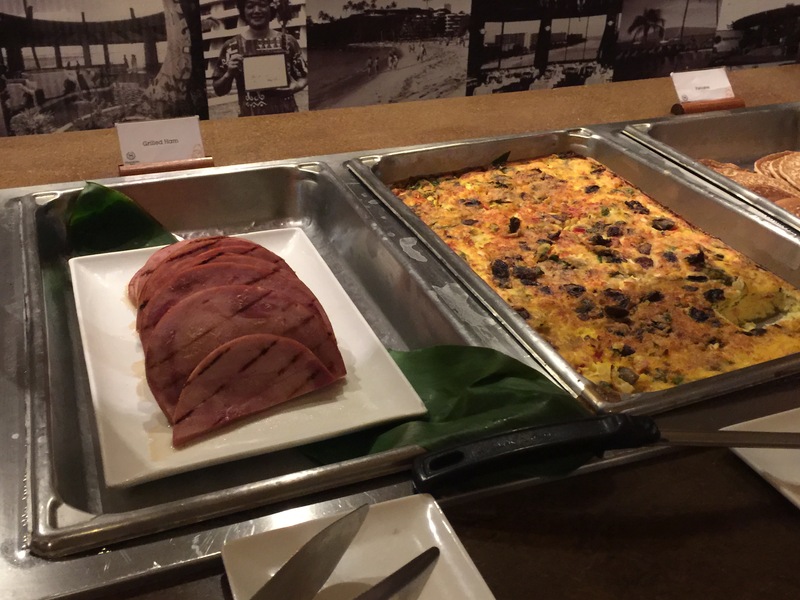 Being in Hawaii, where Asian culture and influence is prevalent, as well as Asian tourism, there were various breakfast items that certainly had more of an Asian influence. Hot miso soup was on offer, to which you could make a bowl and add your choice of nori, green onions and uzumaki fu (wheat cake). Grilled catch of the morning, which was mahi mahi filets were offered as well as teriyaki grilled white fish along with steamed white rice and accompaniments of picked daikon, cucumber and konbu. 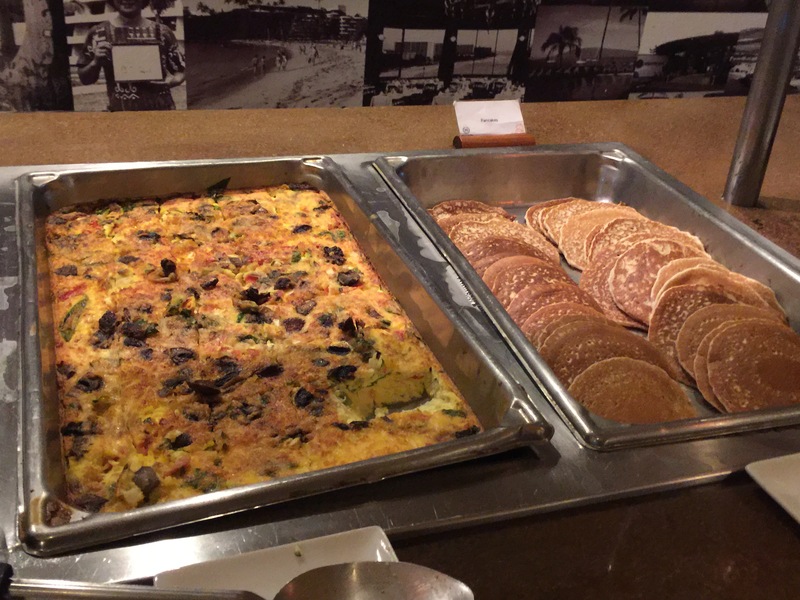 If you wanted a more traditional western offering, there was an omelet station set up where you could get a made-to-order omelet with all of the fixings – diced ham, tomatoes, mushrooms, spinach, baby shrimp, onions, cheese, etc. Of course you could also get fried eggs and sunny side up eggs as well. Of course, there’s always going to be those who want a healthier option. Being Hawaii where fresh fruit is plentiful and always in season, there was plenty of fresh and delicious fruit to be found. Fresh cut pineapple, honeydew, cantaloupe and watermelon along with bananas, oranges and apples. There was also segmented peaches and pears as well as fresh strawberries and fresh cut papaya. All of which you could enjoy with cottage cheese, plain and strawberry yogurt. 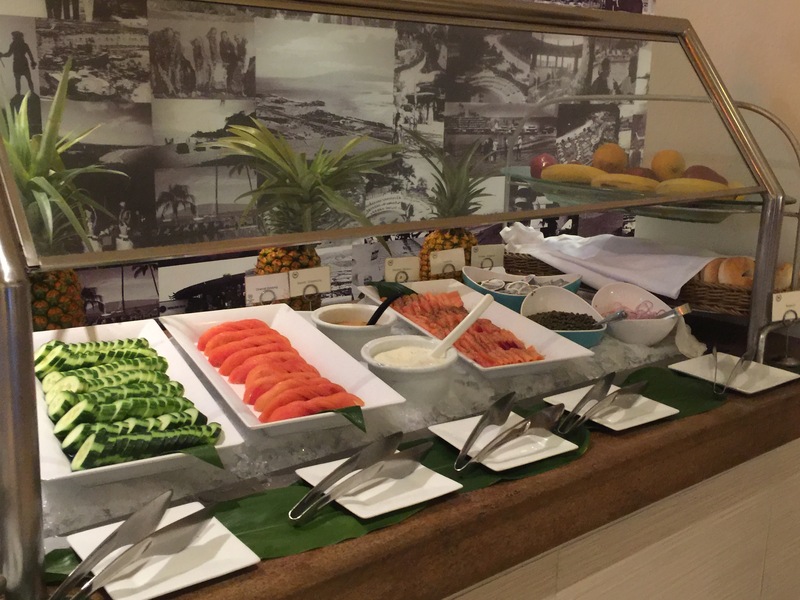 I love that you get the tropical fruits like the fresh papaya that you normally wouldn’t find at any other buffet breakfast at many other hotels around the world. 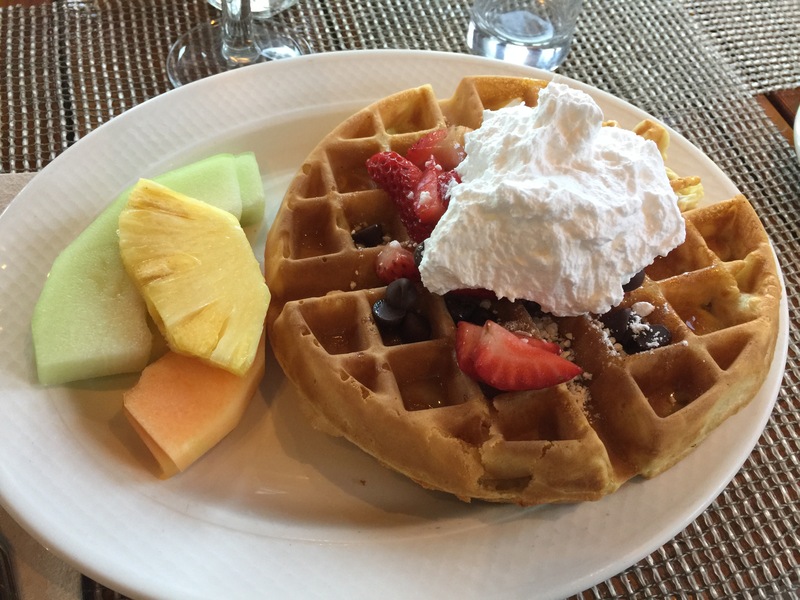 Finally, my favorite part of this breakfast buffet was the make-your-own Belgian waffles. 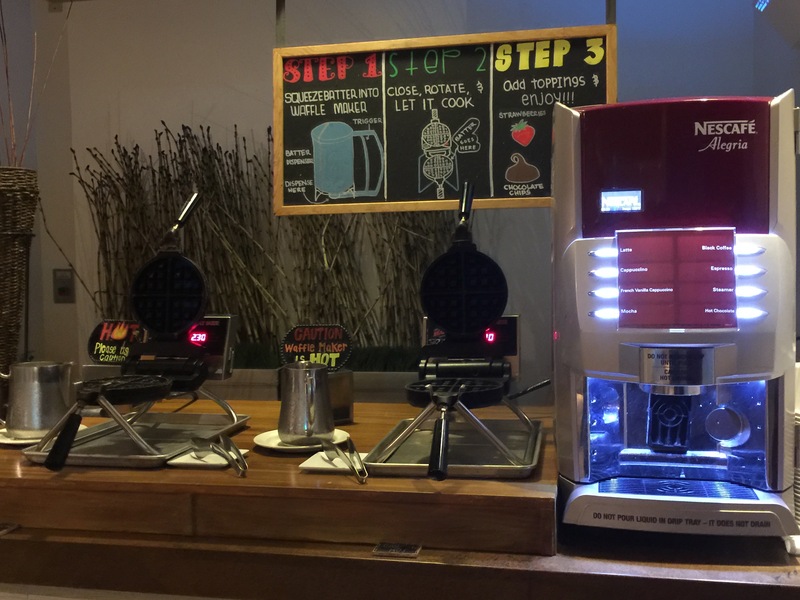 As a kid, I used to see make-your-own waffles at a bunch of hotel breakfasts, but because people can’t play nice and overfill the waffle maker and burn the waffles and do other bad things, many hotels got rid of their waffle makers. But here, at Black Rock Kitchen, they offered make-your-own waffles as a breakfast option, and you know I made myself a waffle every single day. Simple and delicious, and definitely filling, Black Rock Kitchen offered a bunch of toppings for the waffles. Fresh sliced strawberries, pineapples, raspberries, chocolate chips, maple syrup, coconut syrup, whipped cream, chocolate chips and powered sugar, this was like sugar heaven for me. Make a fresh Belgian waffle, top it with strawberries and chocolate chips, sprinkle on some powdered sugar and add a dollop of fresh whipped cream, and it was fabulous. Chocolate and strawberries, a beautiful combination. 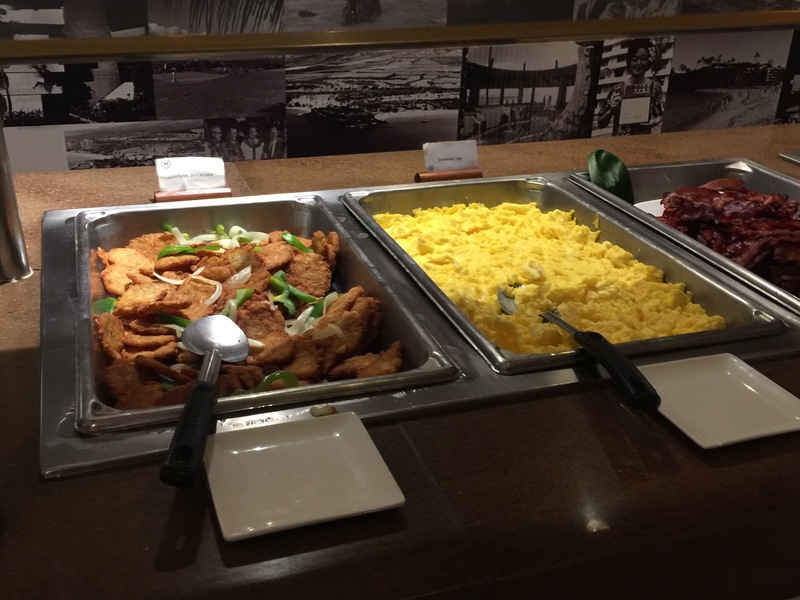 With options like Belgian waffles, made-to-order omelets and bacon and ham, what more do you need to start your morning off right? 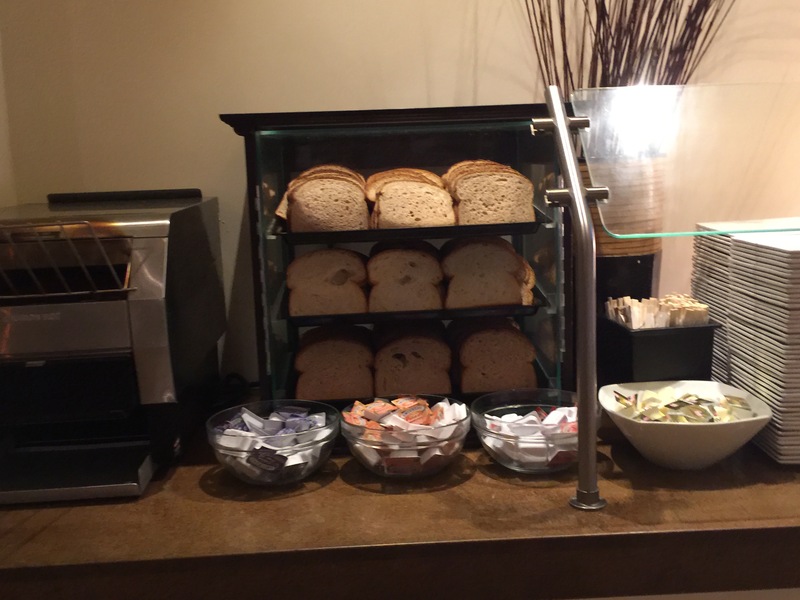 Ok, you could get fresh cut fruit and a bowl of cereal to go with some toast. But we’re on vacation, why be healthy? I’m never going to eat like this at home, so I might as well live it up while I can when I’m on vacation. Black Rock Kitchen certainly provided me all the tools I needed to make my breakfast wishes come true. Since we had been out and exploring a large chunk of Maui since the wee hours of the morning, we came back to the hotel to rest and relax in the afternoon. It was so nice to spend the hottest part of the day just relaxing and listening to the ocean waves as they lapped up against the shore and everyone played in the water. As evening approached, we knew we had to go out on search for some food, but we didn’t really want to go far. Luckily, right in Ka’anapali, in the area right behind where the hotel was located was a large golf course and right near the front entrance to the Ka’anapli beachfront where the golf course is located, is a popular restaurant that we were able to get last minute reservations to. 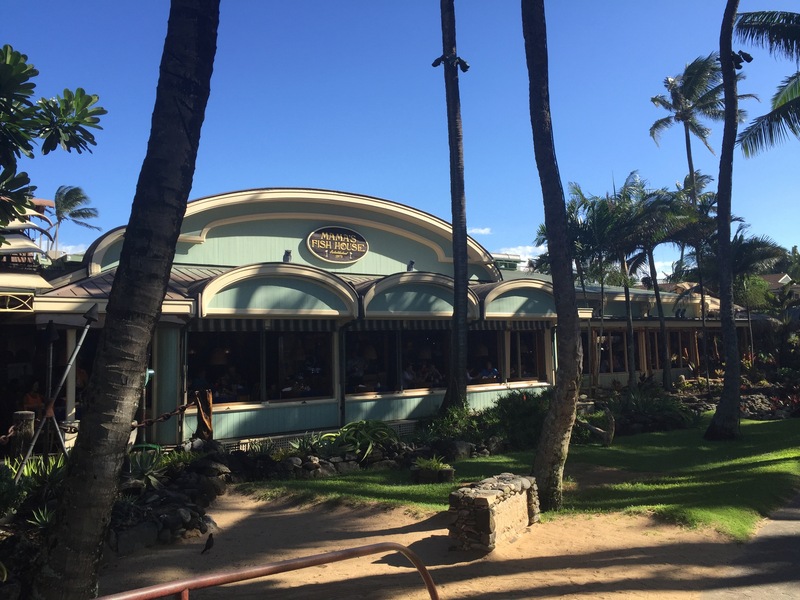 Roy’s is a world famous restaurant from Hawaiian cuisine pioneer Roy Yamaguchi. Born in Tokyo, he got his first taste of Hawaii on vacation while visiting his grandparents in Maui. 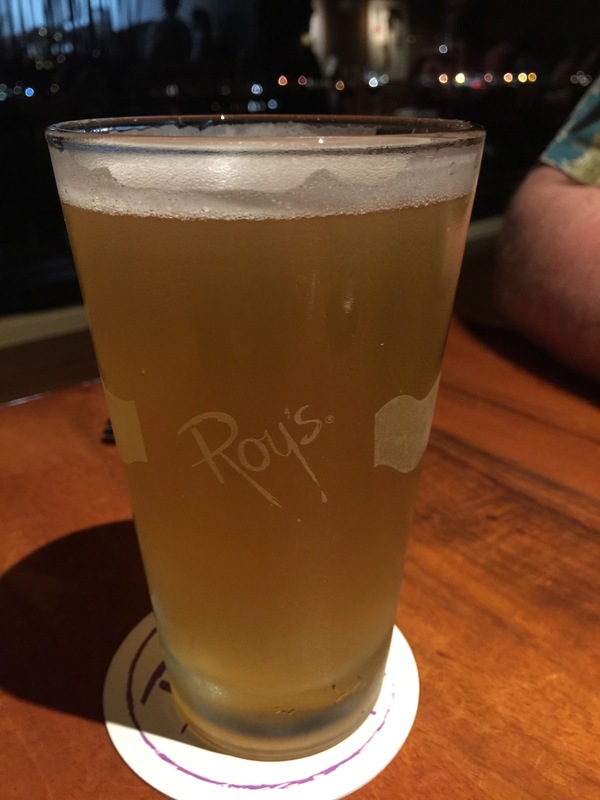 Eventually, Roy graduated from the Culinary Institute of America in New York and after working in LA and making a name for himself, he decided to return back to Hawaii, closer to his origins and the first Roy’s opened in Honolulu in 1988. 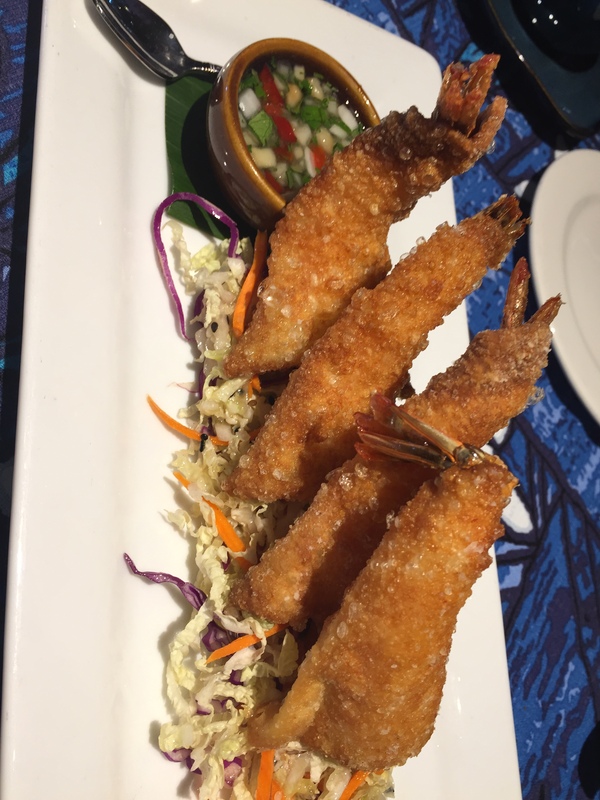 Serving Hawaiian-influenced cuisine, including fresh seafood, steak and sushi, Roy was one of the original chefs who put Hawaiian-influenced cuisine on the map. Today, Roy’s can be found not only in Hawaii, but also on the Mainland in California, Arizona, and throughout 5 other states in some major US cities. Here in Maui, Roy’s is located just off the golf course, and in fact, the table we were seated at was a window table with a clear view looking right onto the golf course itself. To start off our dinner meal, my husband decided to order a pint of Maui Brewing Co.’s La Perouse. My husband had no idea what kind of beer La Perouse was, other than he wanted to try something local and what could be more local than a beer made by the Maui Brewing Co. Turns out that this is a Belgian inspired ale brewed with coriander and local citrus which was a pleasant surprise to my husband. My husband described the beer as a mellow light summer beer. Generally, my husband is one who tends to like the darker, more full-bodied ale’s, however, even though this was much different than what my husband is generally used to, he did quite like the light, citrus flavor of this beer. Additionally, I think because it is Belgian inspired, my husband enjoyed it as well as Belgian ales tend to be what he gravitates towards. As an appetizer, my husband and I chose to start off our meal by ordering the Roy’s Style Dim Sum Canoe for Two. We just couldn’t decide between a bunch of delectable sounding appetizers, so why not order a sampler plate for a little bite of all of them? 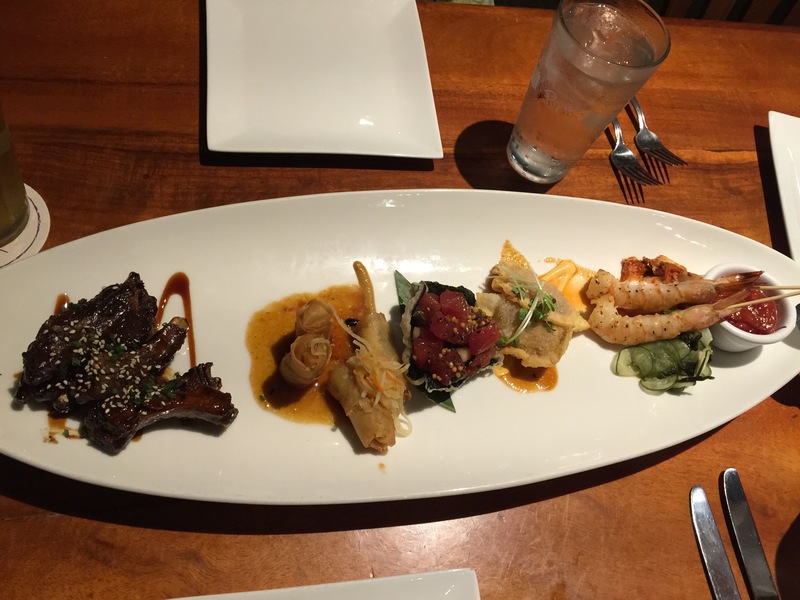 The dim sum canoe for two was made up of pork & shrimp lumpier, baby back ribs, ahi poke, shrimp sticks and crispy chicken potstickers. There were two samples of each item, so that gave both of us a chance to get just a little taste of each of the items. 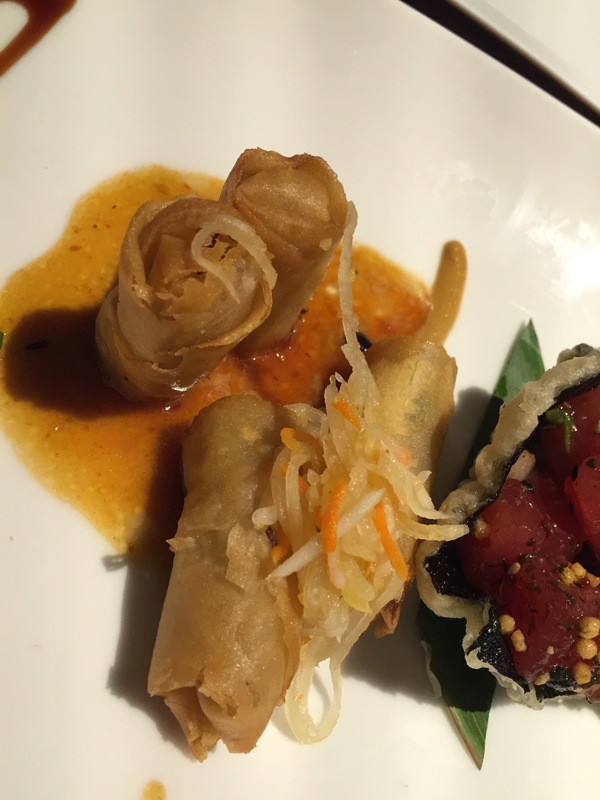 The pork & shrimp lumpia are really a fancy term for egg rolls. Wrapped in a wonton wrapper, the pork & shrimp combination was perfectly fried. The lumpia are nice and crispy and crunchy and the pork flavor of the lumpia really comes through. The sauce that was served with the lumpia was quite tasty as well, as it was a combination of soy sauce and something with a little heat to it. The baby back ribs were quite tender and sweet. 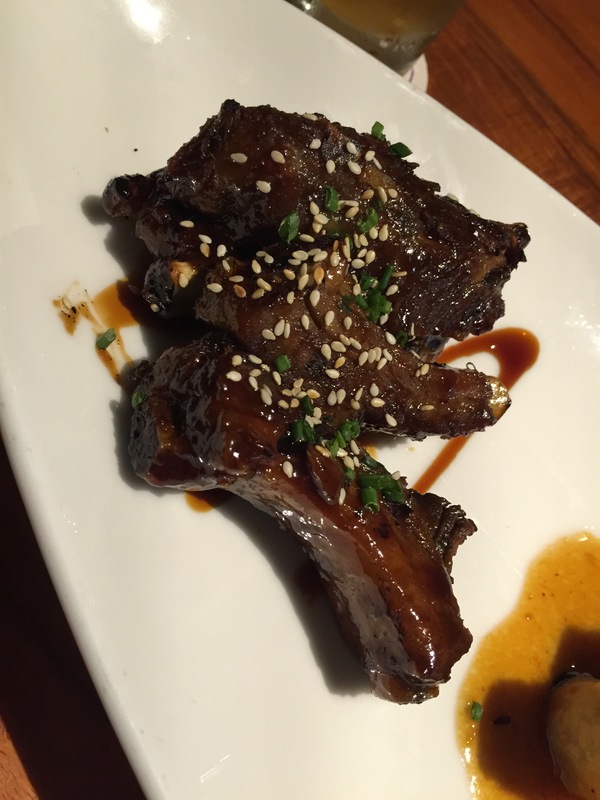 The meat literally was falling off the bone, and the glaze that was atop the ribs was quite sweet and lovely. These ribs were quite meaty, more so than what I generally think of when I think of baby back ribs. The Asian-inspired flavors with the toasted sesame seeds was terrific. 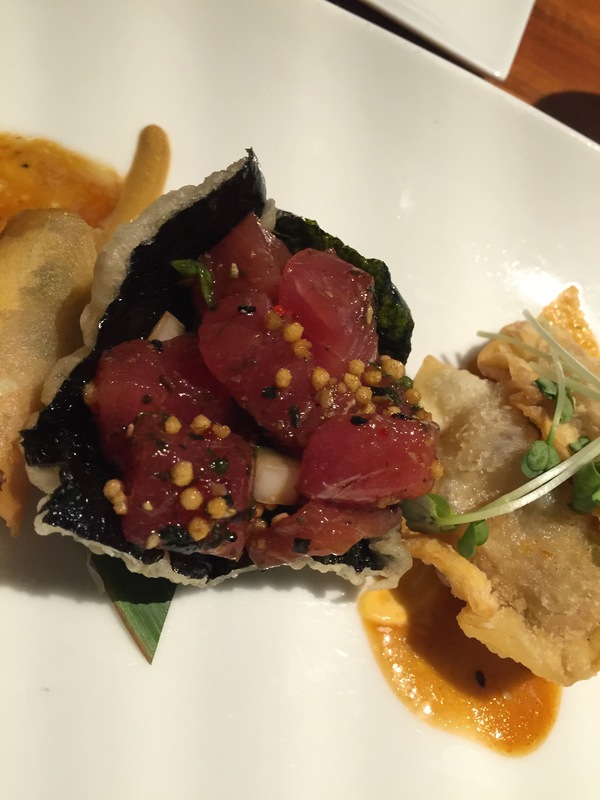 Ahi poke was served in a rice cracker shaped like a bowl and lined with seaweed inside. I loved the unique serving bowl because the rice cracker bowl was edible and the seaweed added a nice salty flavor that mixed well with the flavors of the poke. The poke itself tasted fresh with good sized chunks of ahi tuna. 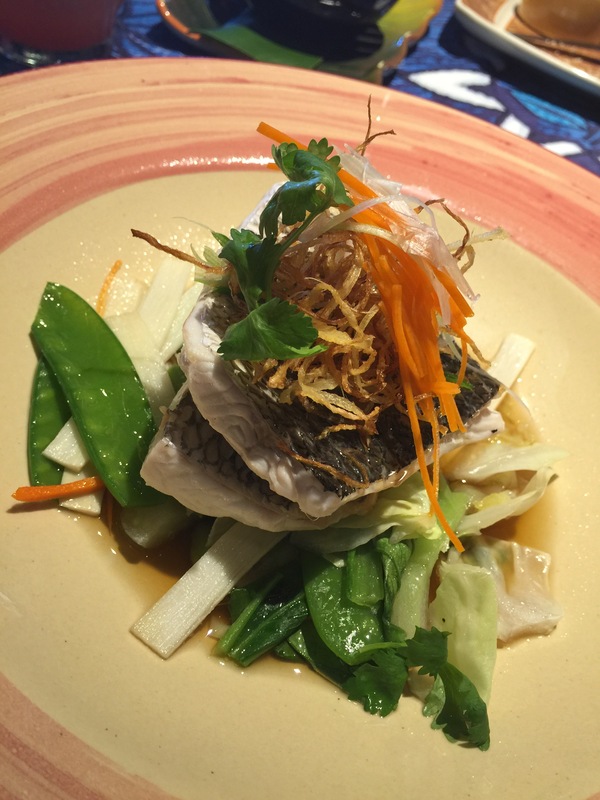 The flavors of the soy sauce and the Maui onions together with the coriander seeds and the fresh fish were terrific. The crispy chicken potstickers had a nice, light chicken flavor to it. The chicken was tender, but in comparing it to the pork and shrimp lumpia we tasted, this chicken potsticker tasted a bit bland. The sauce it was sitting atop was a mixture of some sort of soy sauce and a sriracha mayo. The potsticker could have done with being a bit crispier on the outside to help distinguish the different textures. 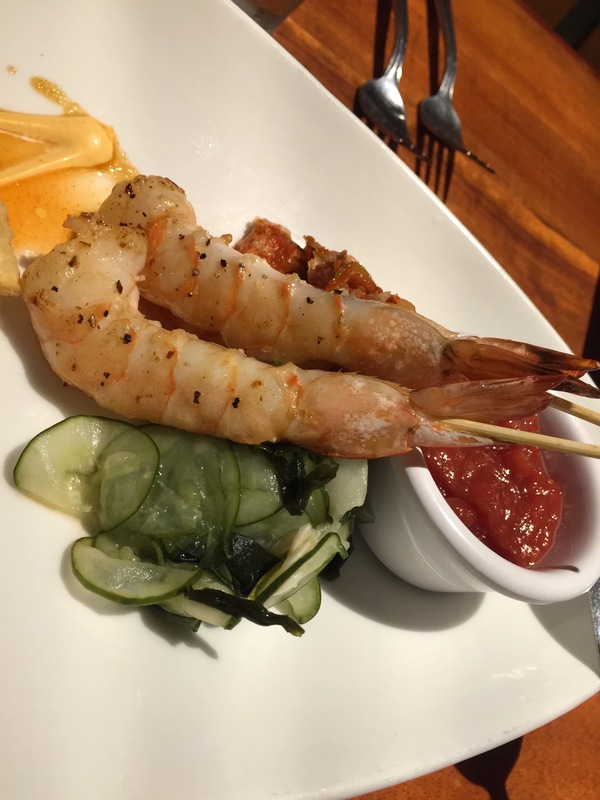 Finally, we had the shrimp sticks. The shrimp was terrific. Big, huge, juicy shrimp which were nicely grilled and tender. The sweet flavor of the shrimp really came through, and that cocktail sauce that the shrimp were served with were just fantastic. The bite of horseradish in the sauce was there, and paired with the sweetness of the shrimp, it was a terrific combination. 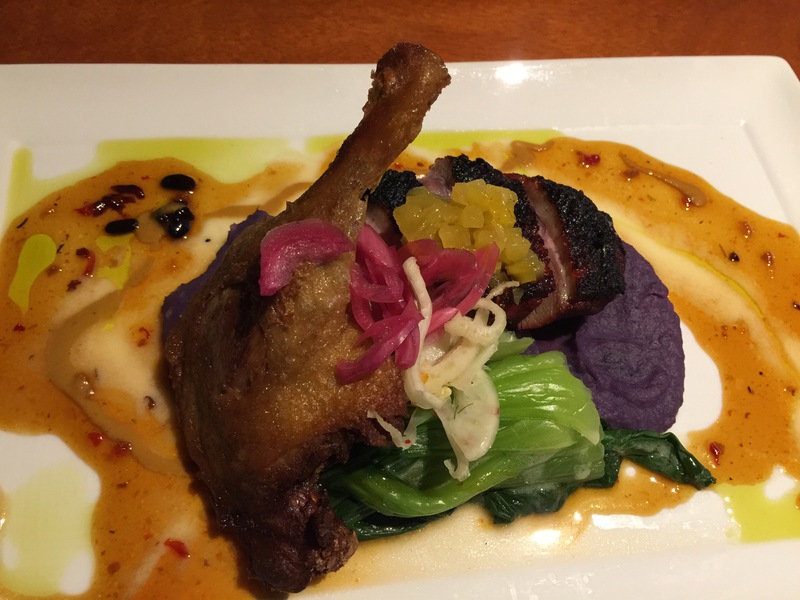 For our entrees, my husband ordered the duck two ways with a char siu breast and a ginger confit leg, the duck was served with Molokai sweet potato, baby bok choi and lilikoi dragon sauce. The plate was so beautifully presented, and the Molokai sweet potatoes really stood out in their beautiful purple color. Unfortunately, my husband didn’t particularly like the flavor of the sweet potatoes as he thought they tasted chalky without any really flavor to them at all. The char siu duck breast was excellent. The breast was nice and tender and the bbq flavor was smoky and terrific. That was my husband’s most favorite part of the meal. Topping the char siu breast was some pineapple salsa which had a bit of a spicy kick to it which combined well with the smoky flavor of the breast meat. Also, the ginger confit duck leg wast meaty and tender. The ginger flavor was accented well by the pickled onions topping it. The lilikoi dragon sauce was terrific and flavorful and helped bring everything on the plate together as one coherent dish. However, with the multiple flavors of the duck, the bok choy, the potato mash, the picked onions, the pineapple salsa and the lilikoi dragon sauce, it did seem that there was just too much jam packed into one plate and it became a bit busy rather than just focusing on one item or one flavor profile. 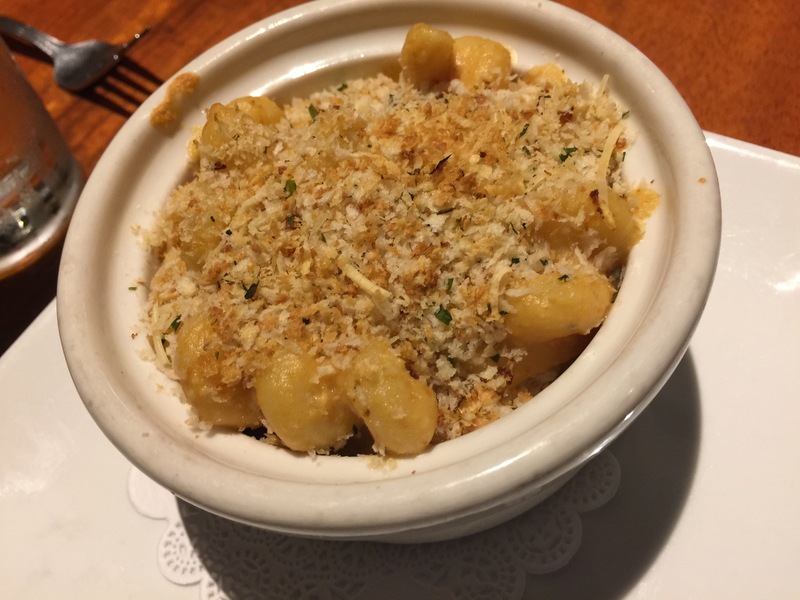 As a side to our meal, we also ordered the bacon cavatappi mac & cheese. First off, had we know that the dim sum canoe for two was going to be so filling, we never would have ordered a side dish to our meals. Luckily, this mac & cheese was a smaller portion size, so it wasn’t too bad. The ma & cheese lived up to its billing and was loaded with bacon flavor. It was light and cheesy and the cavatappi was the perfect pasta to use. There was also a great smoky flavor to the mac & cheese also, which was really nice and also heightened the bacon flavor. And the panko breadcrumb topping also gave the dish a lot of crunch, which was terrific. For my dinner, I chose the “Chinese style” jade pest steamed mahi with sizzling peanut oil, baby bok chop and ginger soy served with a side of steamed white rice. 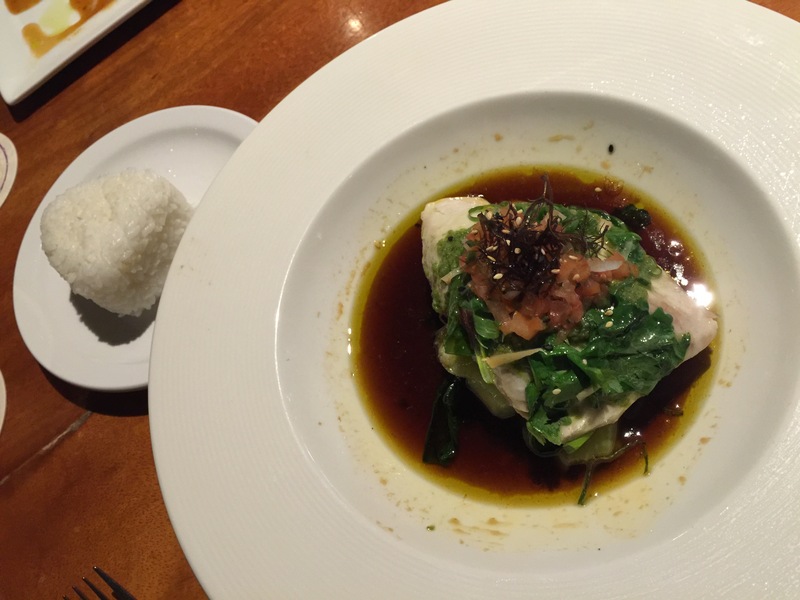 The steamed mahi was amazingly light and flaky. The fish tasted buttery and was very fork tender. The sizzling peanut oil and soy sauce combination was fantastic with just the touch of saltiness necessary to add flavor to the fish. The bok choy was very tender and it soaked up that amazing peanut oil and ginger soy sauce flavor which made the bok choy very tasty. For me, the side of rice was terrific as rice and fish go so well together, and again, the rice could also soak up the flavor of the peanut oil and ginger soy sauce. This was a terrific light meal after the very filling appetizer. When it came time for dessert, my husband and I each decided to get our own dessert. Luckily, the desserts were quite small and individual sized, so getting two desserts wasn’t too bad. 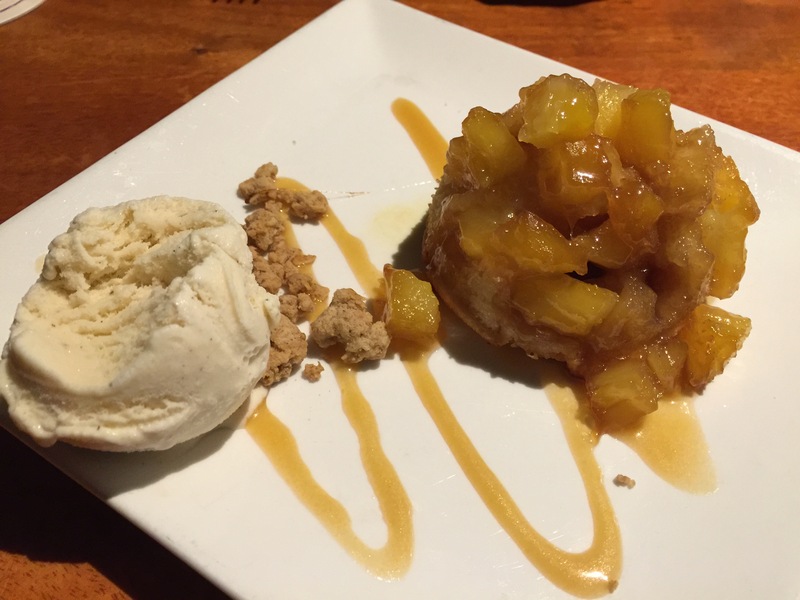 My husband ordered the Sugar Loaf pineapple upside-down cake served with vanilla bean ice cream and caramel sauce. After a very filling meal, my husband appreciated the smaller, individual size of this dessert. It was just the perfect size for what he was looking for. The pineapple upside-down cake was described by my husband as “excellent.” It had just right touch of sweetness and the vanilla bean ice cream was a terrific accompaniment to the light cake. Roy’s melting hot chocolate souffle was my choice for dessert. 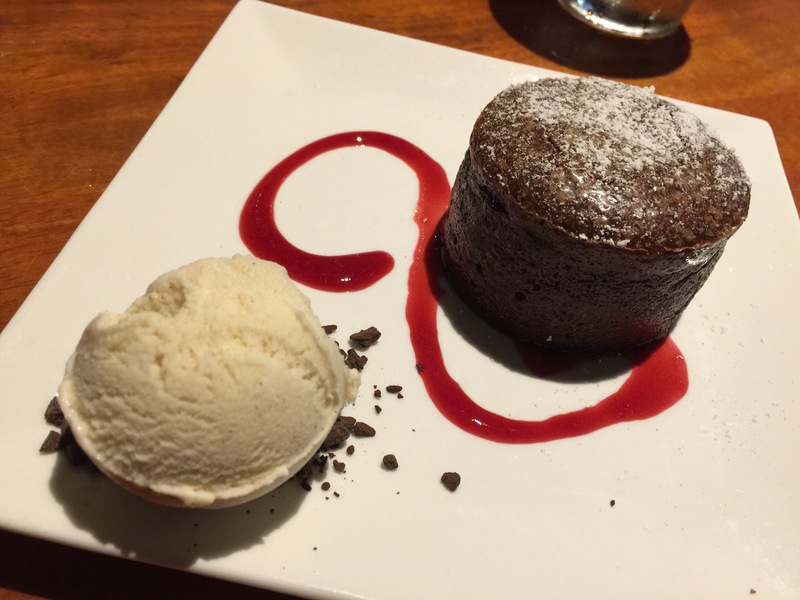 Though, this was more like a molten lava cake rather than a souffle. Decadent chocolate cake with a hot molten center, the cake was served with raspberry coulis and vanilla bean ice cream. This dessert was served sweltering hot, right out of the oven. As soon as I cut into it, you could see the hot chocolate ooze right out of the center of the cake. The outer crust was very nicely cooked, almost like the nice crispy outer crust of a brownie. The chocolate cake was fantastic, not too sweet, just the right touch. The raspberry coulis had a good bit of tang to it to cut the sweetness of the chocolate. And of course, the vanilla bean ice cream had the perfect cooling effect contrasted against the hot chocolate cake. We walked out of Roy’s stuffed to the gills and happy. We’d been wanting to dine at Roy’s for the past two years when we were in Honolulu and just down the street from the original Roy’s. But for some reason or another, the timing just never worked out for us to dine in Honolulu, so we were happy that we finally got a chance to dine at Roy’s in Maui. 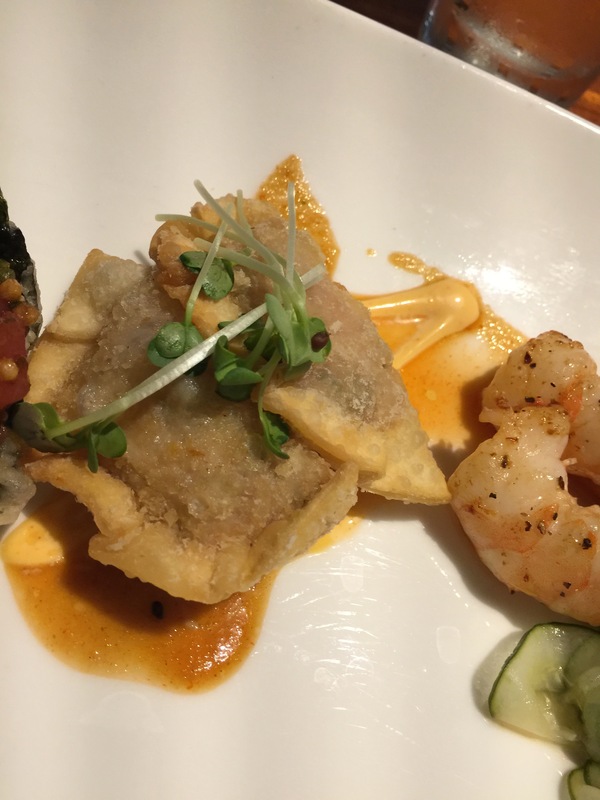 The food was certainly Asian-inspired Hawaiian cuisine and delicious. 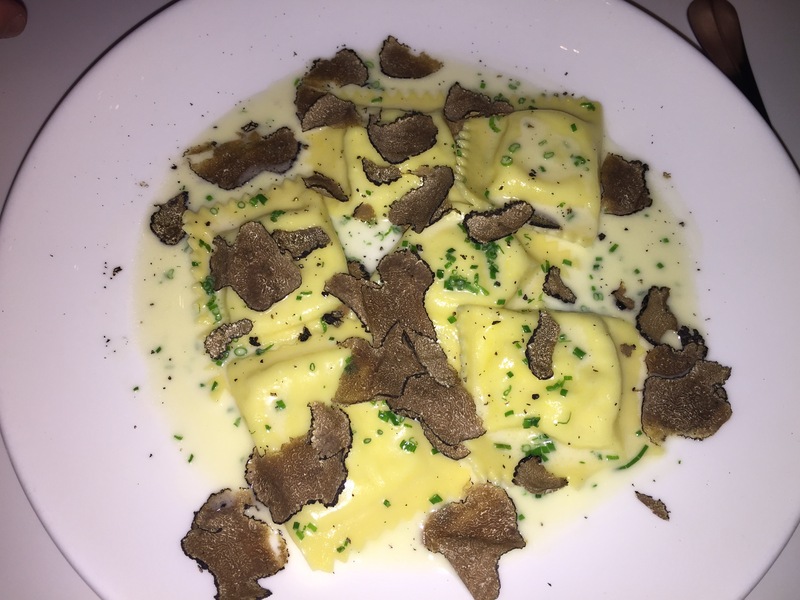 My husband and I were both happy with what we ordered and everything tasted fantastic. Maybe we’ll have to visit Roy’s here in Southern California now that we know how delicious it is.